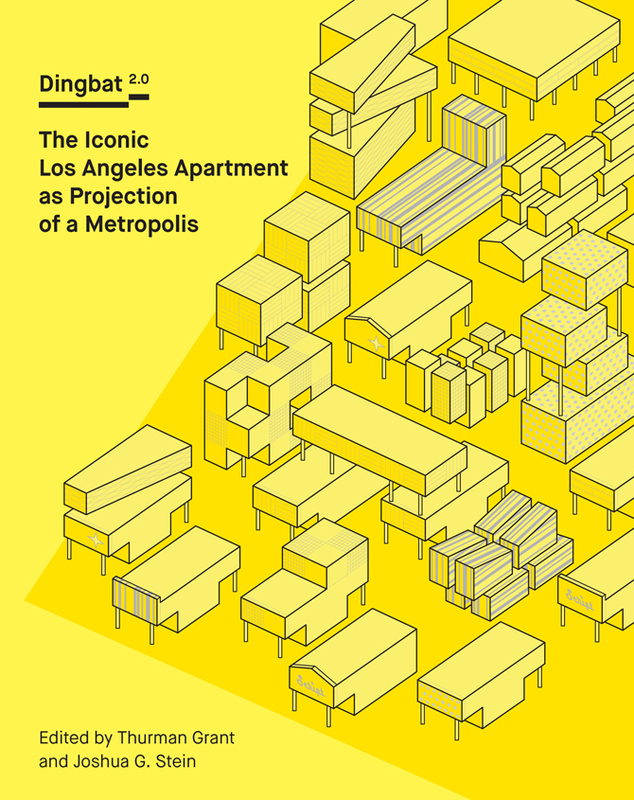 On November 15, 2016, MAS Context organized the Chicago book launch of Dingbat 2.0: The Iconic Los Angeles Apartment as Projection of a Metropolis (DoppelHouse Press, 2016). Editors Thurman Grant and Joshua G. Stein discussed the dingbat and architect Kelly Bair considered its relevance for Chicago. This panel discussion took place at the historic Charnley Persky-House, headquarters of the Society of Architectural Historians. 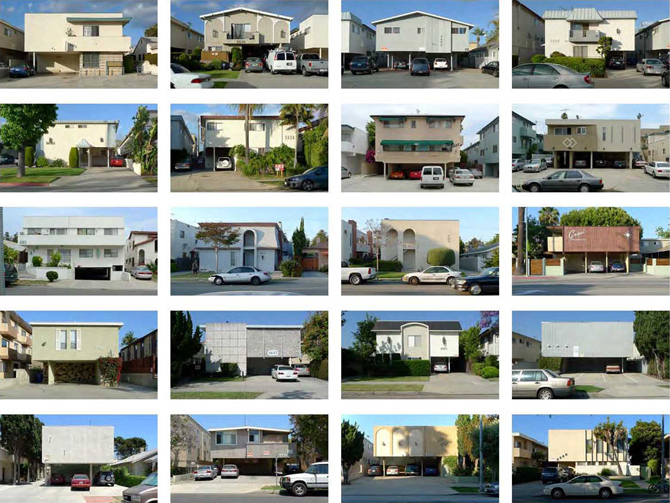 Dingbat 2.0 is the first critical study of the most ubiquitous and mundane building type in Los Angeles: the dingbat apartment. For more than half a century the idiosyncratic dingbat has been largely anonymous, occasionally fetishized, and often misunderstood. Praised and vilified in equal measure, dingbat apartments were a critical enabler of Los Angeles’ rapid postwar urban expansion. 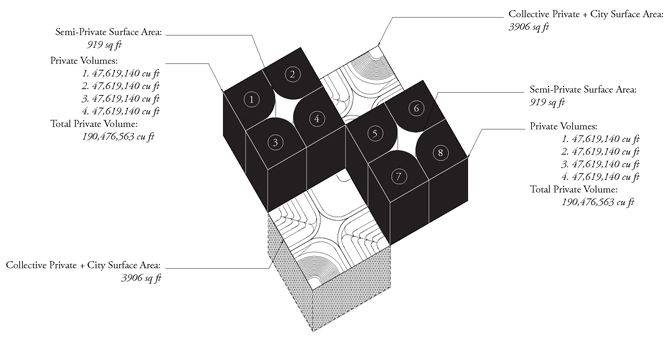 Dingbat 2.0 is published by Doppelhouse Press in cooperation with The Los Angeles Forum for Architecture and Urban Design. Below is an edited transcription of their presentations. Today Thurman Grant and I are going to give an overview of what the dingbat is and where it comes from, talk about its impact on architecture and on the city of Los Angeles, and we’ll look ahead to discuss what the dingbat has to offer us right now. We are lucky to have Kelly Bair to frame the dingbat in relationship to Chicago. It is also great to talk about the dingbat in a city other than Los Angeles as it generates a different discussion than we might have on its home turf. Let’s start with the basics. The dingbat is everywhere in Los Angeles. It is an apartment building that is usually a two-story walk-up. It is built inexpensively. It is our cheap version of a two-flat or three-flat in Chicago, the brownstone in Brooklyn, or the shotgun house in New Orleans. In a certain way, dingbats make up the fabric of the city of Los Angeles. One of the most recognizable things that people always immediately think of when they talk about dingbats is their tuck-under parking. And then, of course, there is the dingbat identity. Besides the tuck-under parking, the dingbat has become famous as a simple stucco box that screams at you through a variety of different facades. The name dingbat sometimes is thought to refer to something like Zapf Dingbats, the typographic characters that include the atomic starburst symbols that do in fact appear on a lot of these buildings. However, this is not necessarily the way the term was originally coined. The term “dingbat” was first popularized by the architectural historian Reyner Banham in 1971. The term had existed before that and originally referred to the unsightly buildings that undermined the quality of the single-family residential neighborhood where all of a sudden nice craftsmen houses were torn down and cheaply constructed dingbats were constructed. In Banham’s book, Los Angeles: the Architecture of Four Ecologies, he describes the dingbat over the course of maybe three pages. This is one of the first instances we can identify as a critical, if brief, discussion of the dingbat. Here he makes evident the power of the dingbat. It is not only a simple description of the dingbat as a two-story walk-up, but instead the dingbat becomes a stand-in for the American Dream, into which Los Angeles epitomizes: everybody is moving to the West Coast, reinventing themselves, and starting anew. However, there is only so much room for everyone to live out that dream in their own single-family house. So to offer the American dream of a single-family home to everybody moving to California, you have to pack them into these very efficient boxes and then still give them the impression that they are living out their American dream. To do this, the dingbat offers, number one: a relationship both with the car and with the outdoors. And then, number two: it attempts to create some sense of community. Although the dingbat only barely satisfies these desires in a crass way, it is important to remember that it does, in fact, deliver on this promise. This is a sample of dingbats that you would see around Los Angeles. We have a Tahitian style here and something that is more mod there. The mod aesthetic worked nicely for the dingbat developers who were largely mom and pop developers. They were people who would just decide to buy a piece of property and see if they could turn a profit. The mod dingbat wouldn’t require them to invest a lot of energy to give it an identity. They could just slap up some numbers, slap on a name, and voila! It somehow distinguishes itself from its neighbors even if it is more or less exactly the same thing behind the façade. With the Dingbat 2.0 book, we were interested in defining and positioning the dingbat as a building type, not simply a style. While there is certainly an aesthetic style associated with the dingbat, there is also a dingbat building type that proliferated during its golden years between 1957 and 1964. There are versions that existed prior and there are versions that exist after this short era. The later versions we would identify as post-dingbats: they might maintain stylistic visual qualities, but they changed some of the fundamentals characteristics, the most obvious would be the original dingbat’s ability to produce a density of housing and parking all within two stories. Without going underground, without sending the parking somewhere else, you have your two levels of apartments, producing a total of six to twelve units per dingbat. Almost all of the apartments are accessed either directly from the landscape, through private stairs (sometimes shared with one other unit) or along an exterior walkway, not through a double-loaded corridor. That is a fundamental change from what would exist on the East Coast or in the Midwest. Again, tuck-under parking, either in the front or in the back depending on whether or not there is an alley, keeps cars close to their owners. We then see an emergence of sub-types, or sub-species, that begin to proliferate throughout the city. We have what we call Hillbats, which cascade down a sloped site. We have Twinbats, Conjoined Twinbats, Double-dings, and Hunchbats. These mutations are primarily driven by site variations and how parking is incorporated. You can imagine that a dingbat on a corner lot might accommodate more parking if accessed from the side than the front or back. This would be a Sidebat. The impact of the dingbat on its neighborhood is significant. The typical lot in Los Angeles is 50 by 150 feet with five-foot set backs on the sides and a little bit more on the front and the back. Dingbats effectively max out the entire allowable building area within this envelope and then pave over much of the remaining surface for parking. This would have significant consequences on the urban fabric after the slow conversion of single-family residential neighborhoods into dingbat neighborhoods. One thing that the dingbats become famous for was their cheap provision of some form of identity. Dingbat owners could distinguish their dingbat from their neighbor’s by employing a range of different themes. Obviously, there is the lure and appeal of the tropics and anything that somehow seems exotic: the “Bombay”, the “Calcutta”, and the “Taj Mahal”. They might also capitalize on the glamour of Hollywood: “The Casablanca” might refer to the Moroccan city, but is more likely invoking the 1942 movie. 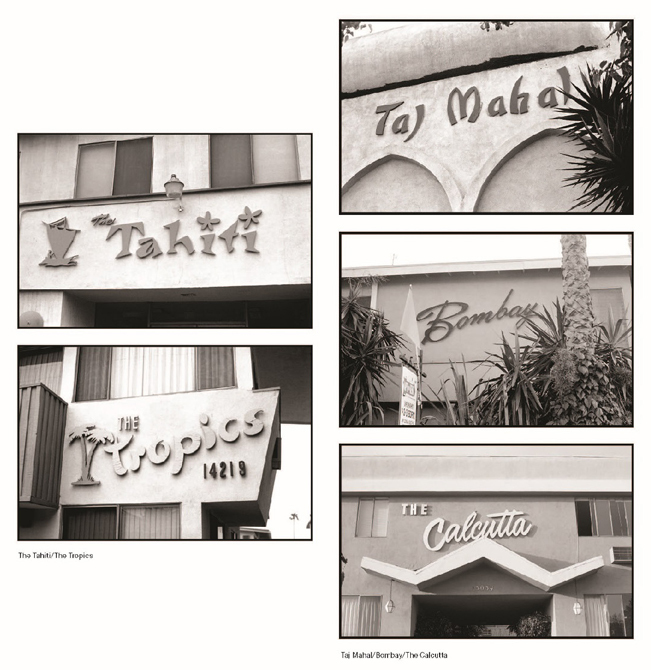 Images of Dingbat names from Lesley Marlene Siegel’s photographic series “Apartment Living Is Great”. And then we can see the impact of the dingbat on the city of Los Angeles. One of the great paradoxes of Los Angeles is that it is one of the densest urban regions in the United States. The metropolitan area of Los Angeles is denser than the metropolitan area of New York. Although Manhattan is much denser than the city of Los Angeles, when you take into account all of the suburbs, the metro region of Los Angeles is much denser than New York. In large part, this is because of apartment buildings like the dingbat, which achieves and urban density that is consistently higher than single-family residential. To call the dingbat a form of tenement housing for Los Angeles isn’t so far off. It really did grow out of the same ruthlessly efficient stacking of human bodies that we would see in the tenement houses of New York. In the same way, it was shaped by code regulation. If you follow the history of tenement housing in New York, you can see how the building organization starts to change to allow for pockets of light and air, which ultimately created what is called the dumbbell plan. 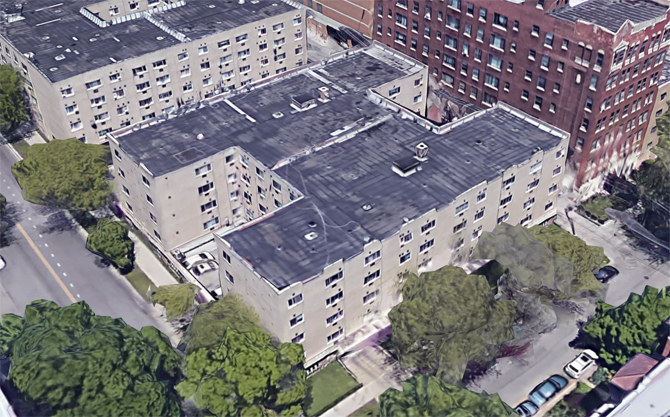 When that building type arrives in Chicago, where there is a bit more available urban space, it could be spread across two lots, but it still maintained an efficiency in packing units. The courtyard type that emerges internalizes access to light and air. In Los Angeles, we have the bungalow courtyards, and then the courtyard parking dwellings. The apartment courtyards were very common in Los Angeles up until about the 1940s. During the post-war era, the dingbat started to move in and make things much more efficient in terms of packing in apartment units. The dingbat maximizes to the utmost how many units you can condense into one lot, but they still maintain an access to the outdoors and the dream of living in a California landscape. I am going to let Thurman talk a little bit more about the typological history of the dingbat. As Joshua mentioned, there is a post-WW2 population boom, as people rush to the West Coast to pursue the American Dream, the California Dream. As people come to Los Angeles, they are housed in both an expanding blanket of single-family houses, as well as apartment buildings. As the population continues to grow, there is an increased need for apartments. The dingbat rushes in to fill this need. As the population increases in the ‘40s, ‘50s, and ‘60s, the dingbat is developed and refined, with the golden age for the dingbat typology stretching from about 1957 to 1964, when the most pure and efficient form of the dingbat is codified. This is an image of Lakewood, a community located north of Long Beach. it shows a typical condition of many communities in Los Angeles that were originally populated with single-family dwellings, with the zoning designation of R1, creating a low-rise, horizontal residential condition that still covers much of Los Angeles. To accommodate the decade-by-decade population increase, parts of the city are up-zoned from R1 neighborhoods to R2 and then R3, leading to a proliferation of medium-sized apartment buildings, of which the dingbat develops as the most ruthlessly efficient type, in terms of providing the maximum number of units at a low cost. By about 1956-1957, the permits for apartment buildings and construction surpass single-family dwellings as a popular form of development. In this grainy advertisement from the Los Angeles Times, you can see a dingbat apartment with the iconographic starburst dingbat symbol in front. This form of two-story building, with very efficient parking, and maxed out volume had become so popular by this point that contractors are offering to build and completely finance it. If you were a mom and pop or other small-scale developer and you had a single-family dwelling, you could tear it down and replace it with a dingbat. This contributed to an infiltration of the dingbat into single-family dwelling neighborhoods, sometimes into neighborhoods that had nice older homes, and a lot of people didn’t like that. In a neighborhood full of older Victorian or craftsman homes, as Joshua mentioned, those buildings would get replaced, often creating negative association with the dingbat. As early as the 1930s, along with the revisions to the zoning categories, Los Angeles started introducing zoning guidelines for increased residential parking requirements that continues to increase in the ‘40s and ‘50s. This leads to the need for more efficient models of apartments, and ultimately into the creation of the dingbat. 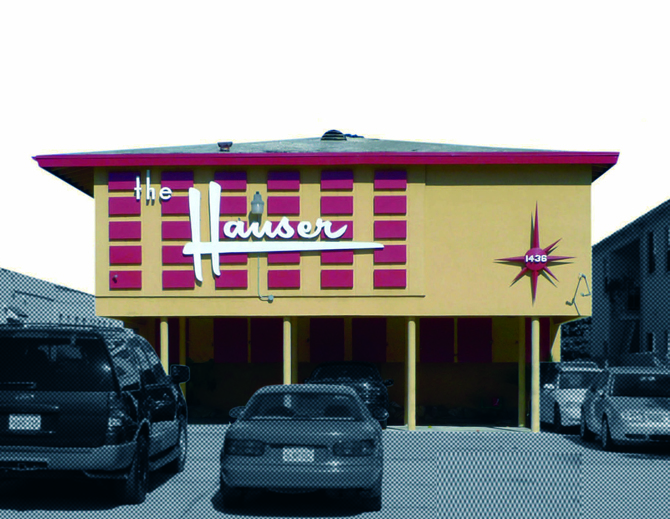 A major factor in forming the unique typology of the dingbat apartment is how it incorporates parking. In earlier 1930s garden apartments you commonly had the parking detached and covered in a backyard in the forms of detached garages or carports, as well as space dedicated to the driveway. The dingbat gets rid of or reduces these things. It takes the parking, consumes it into the body of the building as a first-floor carport, covered by upper-level apartment units, and often reduces the size of the driveway. This creates a very efficient model, allowing for more units to be incorporated into each lot. Let’s go into a little bit more detail about the parking conditions. If you did not have a back alley, you would place parking in carports arranged along the front and you would drive straight in. Some types of dingbats had parking in the front, others accessed from alleys off the back, and some had parking in both front and back. By the 1940s apartment buildings have a requirement to have one parking space per unit. That starts growing slowly so that if you have a larger apartment, you might need one and a quarter, and then eventually one and a half parking spaces, depending on what part of Los Angeles county you were in. As parking requirements continues to increase, the dingbat becomes a little less tenable. When it was modeled to accommodate the initial increase in parking requirements, it proved to be the most maximum efficient type, but its efficiency ultimately becomes outdated by increased parking requirements. Dingbats can be two stories and sometimes three stories, always above ground. There are no underground parking garages or half-level down sub-grade parking garages. Not much space is spent on driveways but you also see that there is hardly any space left over for yards, green space or other amenities. Looking at the urban condition created by the aggregation of dingbats, what we often get in the front yard is a continuous concrete wasteland. You have front yards completely covered in concrete, as driveways and parking spaces, and there is little or no greenery whatsoever. This is seen as undesirable, so zoning ordinances for some cities in Los Angeles county start to introduce requirements that half of the front yard be given over to greenery. So that creates a kind of pinching of zoning code requirements that make the dingbat eventually a less efficient model of apartment building. In our taxonomy of dingbat subtypes, we named the type that emerged from these zoning changes “half-bats.” This type proliferated in neighborhoods such as Palms in West Los Angeles. Ultimately, just as it grew out of changes to the zoning code, the dingbat apartment type would later be killed off in the 1960s. You have a series of zoning code revisions—the parking requirements, the desire for more green space, that start to chip away at the dingbat as a building type. Then in around 1964 an ordinance is introduced that prohibits cars from backing out into the street directly from a carport or other parking space in the front of a lot. This applied to residential buildings larger than duplexes, as it is deemed to be too dangerous. This effectively kills the dingbat as a type, as it relied heavily on carports housing several cars placed along the front façade. After 1964-1965 the dingbat is no longer an efficient development model. It gets replaced by increasingly larger apartment types that we call post-dingbats. A direct evolution after the dingbat is a three-story, sometimes four-story building, where the whole ground level is parking but it is still located on a fifty-foot wide lot, that we call post-bats. In this case, you drive in, walk out, and go up the stair into a double loaded corridor. Some of the taller buildings might have an internal elevator. In our minds, these are no longer dingbats and they are starting to morph into something else, but they are located on the same-sized lot. Other larger types also continue to develop, including the larger “Stucco Beasts,” still built on single lots, and the much larger “Stucco Monsters,” built over two to three combined lots. “Stucco monster” is also a generic term for a variety of these large stucco-clad apartment buildings. All of these types had been developed in the midcentury concurrent with dingbats, so you would see some of these in the 1950s and 1960s. But it is after about 1965, when dingbats are effectively outlawed, that the post-bats were the only remaining type being built. From the 1960s into the 1970s and 1980s, they take over, in direct response to the outlawing of back-out parking spaces. In Los Angeles, dingbats are often derided, but the stucco monster becomes an example of having to be careful what you wish for. People didn’t want dingbats, but these are seen as probably worse, in terms of their large ground level parking, their scale when placed into lower density residential neighborhoods and their aesthetics. Stucco monsters are constantly derided when Angelenos talk about housing, and some of the affection attributed to dingbats today can be seen as growing from the comparison to their over-sized neighbors. One of the most interesting things about the dingbat is that it infiltrates the consciousness of the city and the art world quite quickly. If the heyday of the dingbat is between 1957 and 1964, by the early 1960s, Ed Ruscha has already started examining the crass and cheap commercialism of the city of Los Angeles and documenting it as an art project: for example, his 1966 Every Building Along the Sunset Strip and his 1965 Bronson Tropics, which is clearly a dingbat—actually a Double-ding, which is two dingbats together. Perhaps because of his connection to the art world, Frank Gehry is one of the first architects to look at the dingbat, although he was clearly operating as an outlier in the world of architecture. His design for the 1965 Danziger Studio and Residence presents a stucco façade to the street, yet Gehry wipes it clean of any of the graphic façadism of the dingbat. This project gives a clear nod to the dingbat, almost concurrently to the construction of more typical dingbats that were being produced by small developers across the city. In the early 1980s, Judy Fiskin looks at the dingbat as an exercise in cataloging. She documents these structures front-on, so we can start to compare them typologically, even if it is a visual typology. She starts to classify them as whether or not they have certain features, whether or not they are symmetrical or asymmetrical. While the dingbat had made appearances as an art object, it is not until 1972 that the discussion of commercialism and “low architecture” would enter the academic architectural discourse when Robert Venturi, Denise Scott Brown, and Steven Izenour publish Learning from Las Vegas. It asks what it means to simply take a dumb shed and put a quick façade on it. This is the moment where we finally realize that this might be a viable way of producing modernism, or in this case what we would end up calling post-modernism. This timing sets up a clear contrast between earlier versions of modernism, which were being produced almost concurrent with that of the dingbat. The Case Study Houses program ran from 1945 to 1966 and was supposedly about bringing modernism to the masses, or at least making modern building materials such as steel, corrugated metal, and glass available to the public. However, it was more successful in producing one-off houses for the upper middle class or the wealthy, often times in the Hollywood Hills. In contrast to this, we see the swaths of dingbats throughout the city on the flatlands. We then have the literally high modernism sitting above and looking at the low modernism below. The dingbat then becomes a champion of modernism on the front lines. In the 1998 movie Slums of Beverly Hills the dingbat is used very consciously as a way to set up the concept of Los Angeles or California as the American Dream gone awry. Once it turns into something that is beyond the American Dream, it is becomes representative of something like a global purgatory. The people who are living in dingbats are no longer the upwardly mobile, moving from the Midwest, looking to get ahead. Instead, in the case of the Slums, we see an itinerant family that moves from dingbat to dingbat, often times just before the end of the month to avoid paying for rent. Here, the dingbat becomes a place for the late capital itinerant movement of, not just the upwardly mobile, but potentially the downwardly mobile. Or, in this particular case, the laterally mobile, moving from one dingbat to another, never really moving up, never really moving down, just moving around, just circling around schools and around jobs. At this point, the dingbat starts to represent something different for Los Angeles. The contemporary photographs of dingbats and dingbat dwellers by Paul Redmond, who produced a photo essay for the Dingbats 2.0 book, show the faces of the dingbat, not necessarily as they were intended, but as they are now inhabited. The tuck-under parking is now used as a kind of cheap space for storage, both of goods and of vehicles. It is no longer a place to display your amazingly beautiful 1960s car with pride. It is now just a place to get it off the street to avoid a parking ticket. All of this starts to explain what has become of these neighborhoods in Los Angeles. I walked around with Paul to interview and photograph these dingbat dwellers and learned how these examples provide a view of the real populace of Los Angeles. The study of the dingbat is not only one of a popular or vernacular version of modernism, but also a statistical survey of who is living in Los Angeles at this moment. It is interesting to see the way that the spaces of the dingbat are being colonized, cultivated, and curated in a beautiful way. A woman called Eneida made a cactus garden in what used to be a parking space in the back of her dingbat. Jenni, a marriage and family therapist, and Tom, a film editor, inhabit a two-bedroom dingbat, using one of the rooms as an office. In 2010, the Los Angeles Forum for Architecture and Urban Design ran a competition from which this book emerged. At the time, dingbats were between fifty and sixty years old, so we thought it was a good time to consider an update or reconsideration of this type that is so prevalent in Los Angeles. 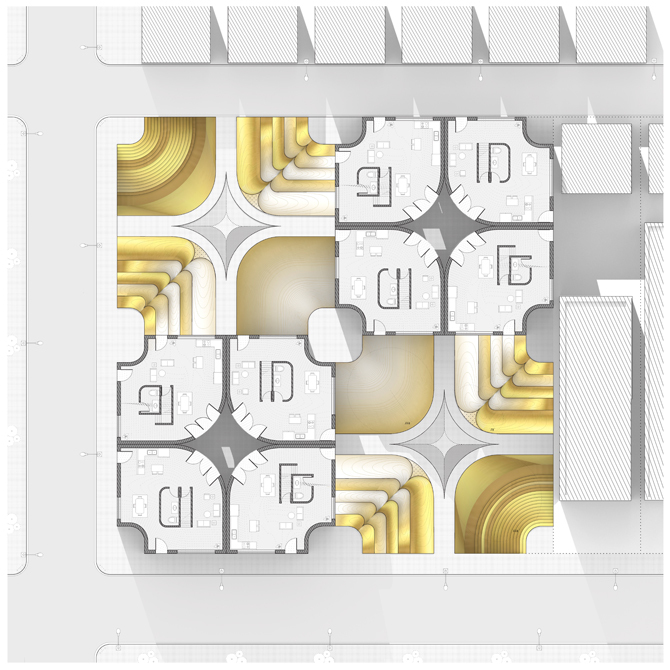 We received about 100 competition entries and they looked at the dingbat both as an individual building type as well as the urban condition of a residential block of dingbats. We gave competition entrants the choice to remodel the type, replace the type, reprogram the type, or whatever other option they wanted to consider. Most people chose, not surprisingly in retrospect, to just replace it. Before looking at some of the competition entries, it is important to note an important zoning code change that happened in Los Angeles around 2003 or 2004. The Small Lot Ordinance was introduced to offer options to address the need for more flexible ways to densify the housing stock of the city. It allowed you to take a standard 50 by 150 lot and divide it into two, four, six, or eight lots, etc… You could also take two or three lots and combine them in order to divide them into ten or so lots. It allowed you to do things like combine parking, share driveways, and have reduced setbacks, etc. The type of lot subdividing promoted by the Small Lot Ordinance permeated many of the competition entries. “Microparcelization,” the winning scheme by Carmen C. Charm, James Black, and Tyler Goss, proposed to inject the Small Lot Ordinance subdivision into existing dingbat lots, after the existing structures would be removed over time, as decided by each lot’s owner. They looked at a series of smaller buildings that would come into lots that had been re-parcelized. 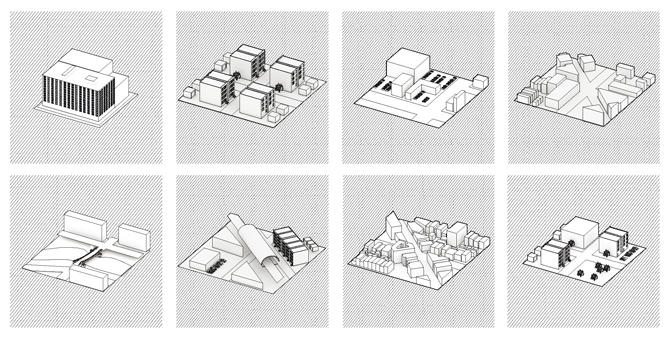 There were a variety of proposals for the smaller building types: one was a series of repetitive boxy buildings, and then there were more individualized iconographic buildings. Here you have six or seven buildings where the symbol that used to be the starburst pattern has now grown into an entire building, creating a new sort of icon. Instead of housing only renters in these single apartment buildings, within one lot you are actually injecting opportunities for home ownership side by side with rental units. “Microparcelization,” by Carmen C. Charm, James Black, and Tyler Goss. 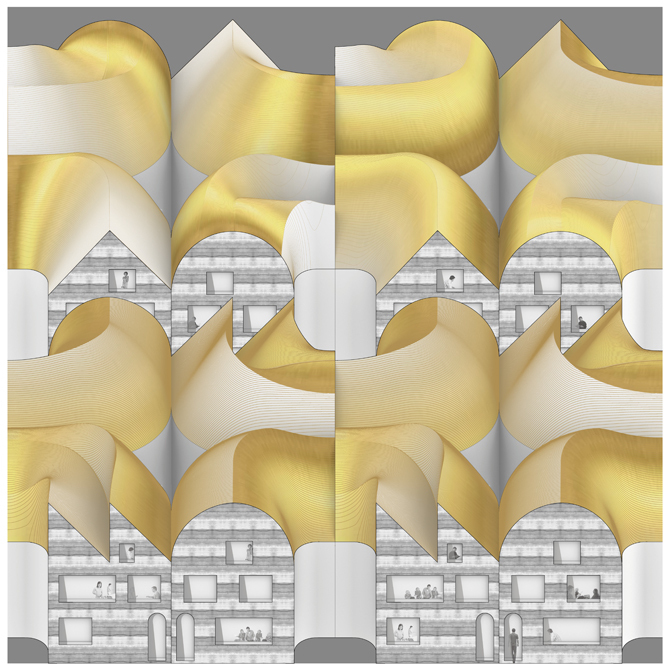 “Variegated Mat-ScapeTM” by GP/S [Gary Paige/Studio] proposed to blanket the dingbat neighborhoods with a uniform pattern that looked like a series of pixels flowing chaotically everywhere but were, in fact, contained within the standard 50 by 150 lot. The pattern appears continuous and roaming, but it maintained the lot sizes that exist now. “The Flip” project by Caroline Filice Smith wanted to take the existing dingbat apart into its constituent parts. They are then mashed up, amplified, and reconfigured into tower structures. The dingbats are re-imagined into a new iconography for a new century, amplifying the iconographic imagery of the original building type. It was one of the more graphically exuberant projects. “The Flip,” by Caroline Filice Smith. Some competition entries looked at reprogramming the dingbat, like in the case of “The Dingbat Demographic” by Liz Falletta. The proposal explores minor remodels that could accommodate emerging demographic and neighborhood demands, incorporating things such as daycare, electrical vehicle recharging stations and transit-oriented parking for the developing metro train system. The original decorative names of the buildings are also revised to work with the new programmatic reconfigurations, incorporating names such as “The Last Resort,” “This Too Shall Pass,” and “Pomp & Circumstance.” Other proposals considering programmatic revisions looked at amending the building by stacking things on top like a hat or creating a coonskin cap. They would provide a new program on the roof, such as a public garden. Another thing that came out in the competition entrants was a reconsideration of the stylistic influences that influenced the original dingbats. If you recall the John Chase quote that Joshua mentioned earlier, he mentioned the stylistic influences on mid-century modernism coming from other design fields including automobile design, interior design, and product design. One project (by Jonathan Kleinhample) used updated automobile design aesthetics, here taking that of recent electric vehicle design and stylizing floating pod-like structures that infiltrate existing dingbats. Another project (Configurator App, by Studio Griffa: Cesare Griffa, Chiara Tournour, Federica Di Iorio, Federico Rizzo, Panagiotis Gkoliaris) took the idea of taking the graphics of iPhone skins and applying them to the new buildings. In this scheme, you could order everything on Amazon.com, have it shipped in, and then plugged into a larger structural scaffolding. So, within the overall range of aesthetics exhibited by the range of competition entries, it was an interesting thing to look at how some of the same graphic influences on dingbats were updated from midcentury to twenty-first century aesthetics. The Dingbat 2.0 Competition proposals were from 2010, so they are still showing the effects from the bust of 2008. Since then, there has been a resurgence of development in the city along with a clear mandate for densification. We turn next to the current conditions in Los Angeles in terms of densification—because it is densifying—like most other cities in the United States. The dingbat was probably the most successful building type in terms of densifying an already existing city fabric, which is why it still maintains its relevancy today. At the moment, city of Los Angeles is densifying both through dense tower construction and through densification of the residential sprawl. The first version looks more like the density typically associated with centralized cities, with downtown centers comprised of mid to high rise residential towers. Downtown Los Angeles, Koreatown, Santa Monica, Hollywood, and North Hollywood would be some of the major centers of big tower developments in Los Angeles. The dingbat has little to offer in this discussion as it is simply a different urban model. However, there is also the question of how to densify the existing urban sprawl, and here, we have much to learn from the dingbat. At the moment we see two primary modes of densification within the residential fabric (different from the new centers of tall residential towers). One is the Small Lot Ordinance that Thurman talked about, which, put simply, means taking a single-family lot and putting four or so single-family residences. In addition to that, you can couple two or three lots to maximize and share parking and common spaces, allowing even more single-family units on several lots. This trend clearly continues the American Dream model. This is about property ownership. It takes the dingbat model of density and then consumes the single-family home model back into its internal logic (beyond that of the dingbat’s façade or superficial tropes). Much of the work of the Hayden Partnership explores the potential of the Small Lot Ordinance, combining dingbat levels of density within the model of free-standing single-family units. On the other hand, we another emerging housing type most commonly referred to as five-over-one construction. This is more like the continuation of the dingbat as an invasive species, and we see it taking over neighborhoods in not only Los Angeles, but across the United States. Like the dingbat, this species has figured out a way to conform to building codes, satisfy developer needs, and address the demand for housing in cities across the United States. It is comprised of inexpensive wood stick construction—cheap two-by-four construction just like the original dingbat—over a one or two floor concrete pedestal used for retail or parking. While the scale and density is greatly increased over that of the dingbat, it also abandons many of the goals of the dingbat, namely maintaining a connection to the landscape. Then there are a couple of hybrids, or alternative models, within the city of Los Angeles, which I think are also interesting to discuss. These still try to maintain the identity of something that we could call the dingbat while now spanning across multiple, or much larger lots. The Formosa 1140 apartments by Lorcan O’Herlihy Architects (LOHA) places parking underground to produce a public parklet with multiple units adjacent. In addition, different from the Small Lot Ordinance, there is the accessory dwelling unit (ADU), an updated version of the granny flat that can be inserted into the backyard of a single-family residential unit. Unlike the Small Lot houses which night demolish one single family residence to construct up to six new ones on the same lot, the ADU maintains the original housing stock and inserts density into the backyard. That is where we will leave things off in terms of the possible continuations of the dingbat. We will turn it over to Kelly, who can talk about what is happening in Chicago right now. I lived in Los Angeles for about thirteen years and I spent quite a bit of time in dingbats. I never lived in one, but I was a graduate student at UCLA, so I went to many parties. My memory of them is a little bit hazy, but I do remember them. And I also remember how much Angelinos really love them, as much as they love to hate them. I have tailored the talk in three parts, similarly to the way the book is structured. But it also makes logical sense to do so, looking at the past, present and projected. Tonight, I have been asked to frame the discussions in the book through the lens of Chicago. We’ll begin with the past. As we know, Chicago’s architecture has long embraced housing on stilts. The go-to precedent for this is Mies’s 860-880 Lake Shore Drive Apartments. Here, building and ground find a direct connection to one another through a setback glass enclosed lobby, a thin slab on grade, and perimeter-defining columns. There is no evidence of the car. It is tucked away and hidden. While Mies’s Lake Shore Drive Apartments were widely riffed on along the lakeshore and well beyond the city limits of Chicago, things began to shift in the early to mid-1960s when it seemed that modernism’s heyday was coming to, if not a definitive end, a rethinking. This was especially true when it came to high-minded design ideals that were being applied to multi-family housing. For one, the increasing relevance of the car became a defining characteristic of architectural typologies, especially related to housing. 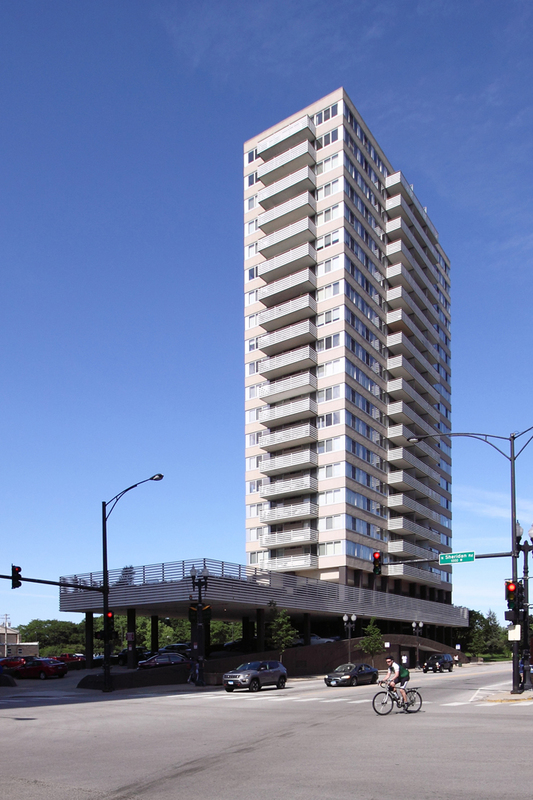 A 1963 housing tower by Milton Schwartz and Associates located at 5601 North Sheridan Road is an early example of this. It shows the introduction of the car, though I would argue tentatively, in the form of a driveway which leads up to a parking garage that is one level up. It wraps the façade, ultimately becoming the façade, and does the work, along with the columns, of lifting the building off of the ground. 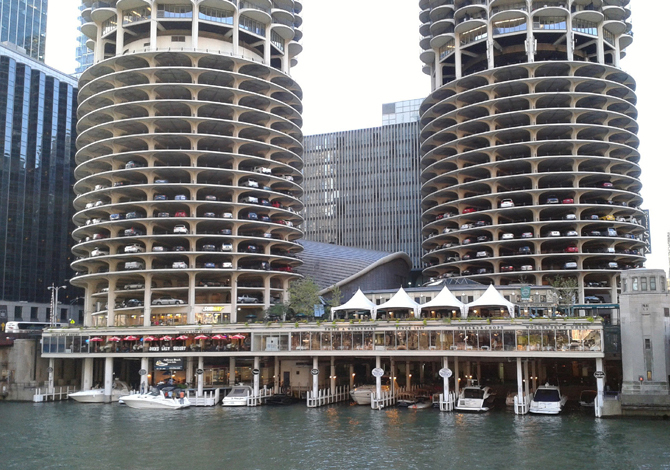 At the same time, Bertrand Goldberg enters with Marina City, where car becomes fully integral to the elevation of the apartment towers. I would argue that here is where we see a shift in the modernist idea of control, as nearly one third of the towers are given over to the object of desire of the inhabitants, in this case the car. But these are buildings we know, and they are stories that we have heard in reference to Chicago’s architectural history. There are other stories in Chicago’s history, especially when it comes to residential development, that are less talked about and they may provide a bit more insight for us into the dingbat. More descriptively, the building type is four stories of masonry and wood framed apartment units built on top of a concrete platform no more than seven feet above the street level. They were incredibly compressed at that level, similar to the dingbat. They were square and blocky in form, and featured a 1960 styling, which was not universally beloved. They were reviled by nearly everyone, and yet, they are still standing and fully occupied with satisfied residents. They always occupied one or two single lots in the city. Essentially, what determined the shape organization of the four plus one is whether they were sited on one or two lots. On a single lot they were in the shape of an I in plan. On two lots they were in the shape of an H, with a bridge connection between the two bars. It is worth noting that dingbats are identical to four plus ones in nearly every way except one, which is their height. While four plus ones occur primarily in dense areas with fairly high property value, dingbats are spread at a lower density across the entire Los Angeles area, though there are concentrations, as Joshua and Thurman mentioned. For Chicago, the four plus one may be the closest typological cousin to the dingbat, especially in the sense that people really didn’t like them. Part of this had to do with years of built-up NIMBYism, but people also thought that they cheapened the aesthetic character of the neighborhoods. Now I am going to talk about the present, of which there is a lot of overlap. It is interesting to look a bit more closely at what Chicago is currently doing and see, despite the differences in urban context, how similar it is to Los Angeles. 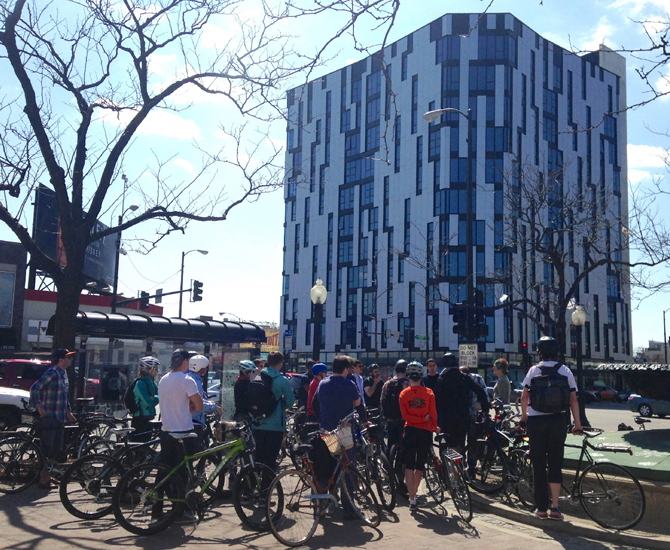 In 2014, Chicago, as with most cities, saw an uptick in something called transit oriented developments or TODs. TODs are multi-family housing developments, usually in the form of towers that are located within half a mile from a major transit stop. An early pioneer is Wheeler Kearn’s 1611 West Division, which is a housing project that takes advantage of a few of TODs lessened requirements, with one being parking. In this particular case, there are zero parking spaces for cars, but there are 99 parking spaces for bikes, one per unit. There are three bus stops and one CTA L line within the TOD radius. These TODs are highly structured around transit nodes yet they tend to be popping up at places where there aren’t existing tower typologies. I think the question with TODs remains, how might these be affecting community building or re-imagining the social aspects of living? We haven’t really seen them around long enough to see how this will play out. While their contributions to broader urban issues is clear (for example, reducing traffic while increasing CTA ridership), they preserve the large-scale internal condo typology and the social aspects of multi-family living, where residents remain fairly separate despite their physical proximity. In the end, not much has changed with regard to that. An alternative to these large-scale developments is now popping up in Chicago and, in contrast, it is to return to small-scale development over multiple locations. However, small-scale hasn’t always been presented as a good thing. 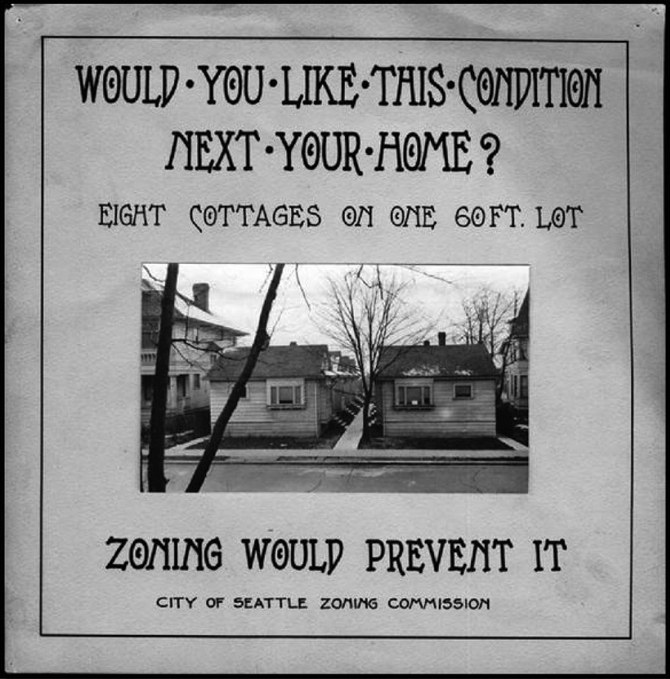 This 1920 Seattle zoning commission advertisement warning of smaller scale, i.e. higher density than single family house on a single family lot, presents a mode of densification that is monotonous and on an over-crowded housing tract. It is similar to the tenement qualities that were projected onto the dingbat. Those views of smaller scale density have persisted. Chicago’s answer to this resulted in a large number of what we call phantom triplexes. I happen to live in a phantom triplex. Here, the character, scale, and form of the single-family house are preserved, but the unit distribution is hidden behind the façade. More importantly, however, zoning is not only slightly challenged, for example a lot may be rezoned from R1 to R3, but there aren’t really challenges being made to the existing zoning code. Now, however, Chicago is looking to Los Angeles for bolder restructuring of zoning relative to housing. One example of this is the Small Lot Subdivision Ordinance, or SLSO, which Joshua and Thurman talked about. This has actually been around Los Angeles for about a decade, and we are just now seeing a rise in its application, both in Chicago and there. 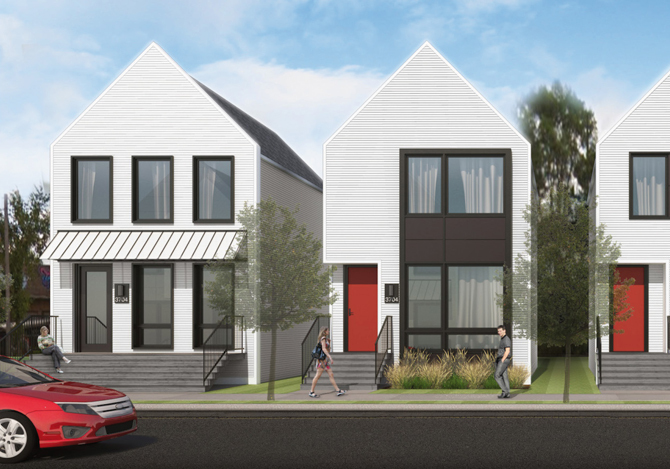 These SLSOs provide increased opportunity for home ownership, especially for first-time buyers, with increased density on a single lot that surpasses the phantom triplex. The downside is a loss of affordable rentals for residents who have been there for generations. So, practically a gentrification and a changing neighborhood aesthetic that may seem as homogenous as the residents that are moving into them. Looking at some of the results of this ordinance, zoning may seem a bit more viable for the long term housing market, or at least for its stability. A couple of things that are happening that are interesting for us as Chicagoans, is that there is a reduction in the minimum lot size from five thousand square feet to six hundred square feet. This applies on land zoned for commercial uses, apartments, condos, duplexes, etc. The second thing is that there are reduced setbacks, so homes can more closely abut neighbors and sidewalks. 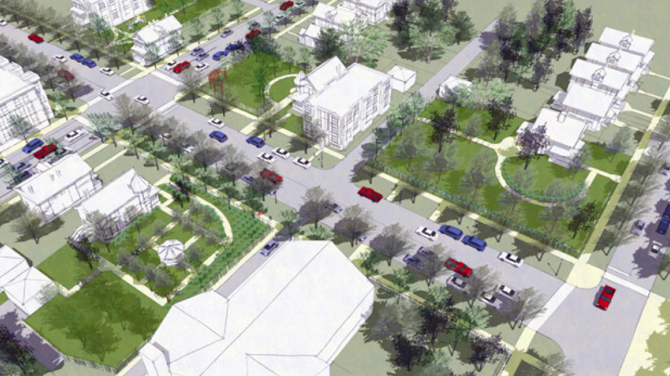 These zoning amendments effectively create smaller communities within a large urban context. 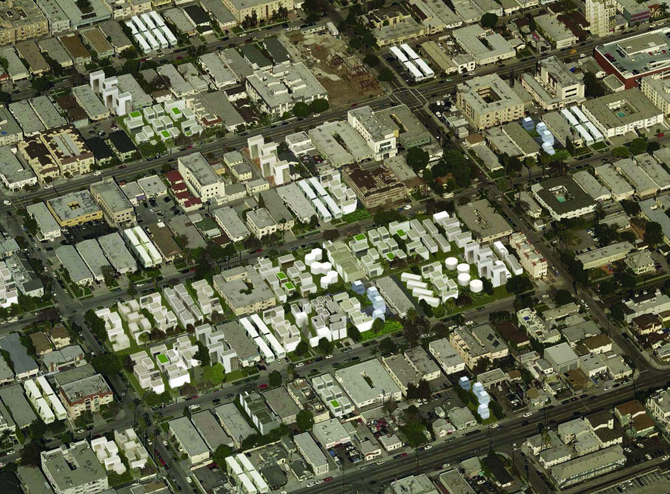 This is Barbara Bestor’s Blackbirds project in Los Angeles’ Echo Park neighborhood. She has a great essay in the Dingbats 2.0 book titled “Deeply Superficial: Excavating the Dingbat from the Art and Architecture Canon” that you should read. This project, built in 2015, essentially takes five lots, removes five single-family houses, and replaces them with eighteen. In a couple of them, or maybe about half of them, they actually start to share parking vaults, so that the identity of the single family house, once you tear away that façade and we look at the section of the building, is slightly skewed from what we are seeing on the exterior. This is a 2016 project in Chicago’s Old Irving Park called Basecamp SFH by Ranquist Development that I think has some similarities. It is not played out through a small lot ordinance, as we don’t have it in Chicago. But it is rethinking the zoning code in a relatively interesting way. It is is a series of forty-eight autonomous homes that don’t share walls, but the zoning is being affected in one particular way, which is the lots are subdivided. They are actually gaining a foot, so they go from 25 to 26 feet wide. But what the developers are adjusting is the length of the lot. That produces a middle zone that allows for circulation, a shared community space and, effectively, a new street. The issue with these, or what is funny about them, is the fact that the only shared walls happen when people decide to go from a two-car garage to a three-car garage. That is when we start to see abutment, and even further maxing densification, even though it is not increasing the amount of people that are living there. They have about nineteen of them built of the forty-eight. This weekend I went to see the projects in preparation for this talk, and what was interesting is that the Chicago developers had been looking at the Blackbirds project and other projects in Los Angeles that are rethinking zoning codes. I want to close with a project of mine. I came across this relatively new program, called Large Lot Program, that is part of Mayor Emmanuel’s “Five-Year Housing Plan,” which “aims to create, improve, or preserve over forty-one thousand housing units citywide.”  The program will enable existing homeowners, block clubs, and non-profits to purchase vacant city-owned residential properties for a dollar. The idea is that these spaces get manicured and groomed to become part of the larger blocks, but you have to live on the block that you are trying to but into these lots. You can also add to your own property, but there has to be some kind of public giveback. So there are some interesting things happening that start to address the vacancy in the city of Chicago, which I think has a different bearing on the zoning issues than they do in Los Angeles. This is the only rendered image that I could find on the Large Lot Program, that someone did to explain ways of beautifying some of these lots using that particular program. I believe this has only been tested in one neighborhood so far, and the idea is that they add one neighborhood each year. I’ll close with projection. This is a project that I did in my office in 2015 for the inaugural Chicago Architecture Biennial. 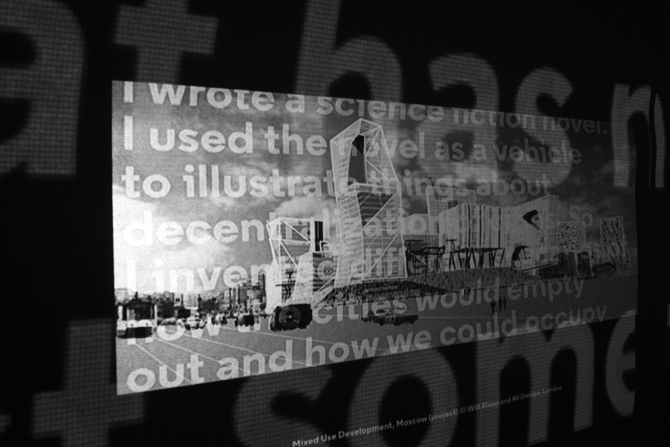 It was part of an exhibition in the biennial titled “BOLD: Alternative Scenarios for Chicago” curated by Iker. Nine offices, were given “The Available City” research project by David Brown as a starting point. Essentially, what “The Available City” looks at is the wealth of vacancy in the city of Chicago. The base understanding of the project is that if you were to take all of the vacancy that is in the city of Chicago that is privately owned, it would be the area of the Loop. If you were to add all of the vacancy that is owned by the city, it is twice that size. So there’s actually quite a bit of land. What David’s visionary zoning code suggests is that one might be able to combine different ratios of public and private land, typically adjacent to one another. We were given the option to work with between one and five lots. Every architect except one chose all five lots, which is really telling. I was one of the ones that chose five lots. I am not going to get too into the specifics but I’ll just quickly say that I zeroed in on a couple of things. I was already working on the problem of urban corners at the time, so I zeroed in on a specific one-mile by one-mile area in the North Lawndale neighborhood. The reason for that specific site had to do with David’s research, so it was tied into that. There was a whole study of the corner types, which I won’t get into for tonight, but the gist of this is to rethink the zoning code. The idea is to move it from a quantification of things like floor area ratios and square footage, which zoning codes always tend to be, towards a qualification of other kinships between private building barns and public collective surfaces. We took five lots and we understood them to be three private and two city-owned lots. We then gridded those lots, effectively taking a similar approach to the winning competition in the dingbats, which is the micro-parcelization. We went from five lots to many more, and they could be broken down even further. In the way that these were laid out, they were roughly about 600 square foot, similar to the reduction for the site size in the small lot subdivision in Los Angeles, which, interestingly enough, I didn’t know about when I was doing this project. Then there was the operation of cutting and filling. The idea was to not find intensification by filling all of these lots, but by micro-parcelization, to borrow that term, through moments of the lot and giving back other moments to landscaping and other types of public functions: gardens, amphitheaters, and so on. The other thing that this project did was to take the general form, the general icon of the house, and force it to turn the corner. It starts to confuse the identity and relationships of fronts and backs. In some ways, it made the project all fronts or all backs or, if you were in the center, a shared courtyards that made them all sides. This project, in the way it was played out here, was thought of as eight units, on what was effectively five lots. There was not a huge increase in density, but because of the way the fronts and/or backs were set up relatively to the new grid, there was an opportunity to entering and existing similar to the phantom triplet. Effectively, it could be upwards of sixteen to twenty-four units, depending on how you define the interior. But again, these were thought of as single units. These are a couple of images from the exhibition. The one on the right is showing some of the landscape elements that we designed, including the pathways. The way that the grid starts to establish access allows for certain moments of access through and across the site, but also limits it so that there are moments of privacy and limited access for people that shouldn’t be in the center court of the house or between the houses. That is my survey of the history of the dingbat relative to Chicago, or as close as I can make those connections, the sampling of what I have seen around town in the past couple of years, and some projections on where things might go. 1. This portion of the lecture substantially refers to the development of the dingbat as covered by the Dingbat 2.0 essay “The Embodiment of Speculation and Regulation: The Rise and Fall of the Dingbat Apartment,” by Steven A. Treffers. 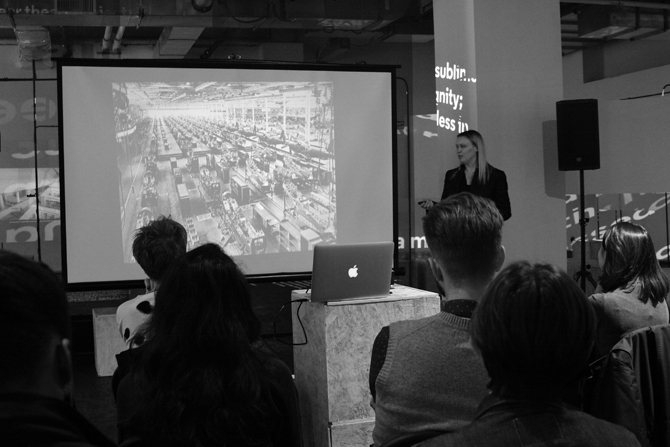 Kelly Bair is principal of Central Standard Office of Design, an architectural research studio based in Chicago. Her work has been exhibited in New York, Los Angeles, Toronto, Chicago, and Detroit. Most recently her work was exhibited in the 1st Chicago Architecture Biennial (2015) and the upcoming 16th International Architecture Exhibition in the U.S. Pavilion at the Venice Biennale in collaboration with Kristy Balliet of Balliet Studio and Bair Balliet. Bair is an Assistant Professor of Architecture at University of Illinois at Chicago. 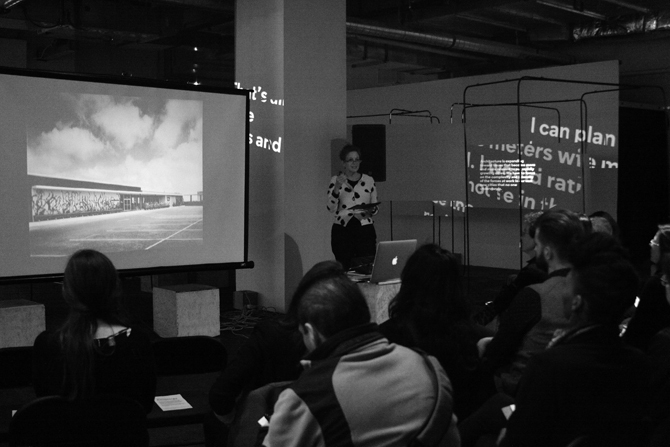 She is also co-founder of Possible Mediums, a collaborative of four Midwestern architects and educators interested in shaking up the context and format in which architecture is taught, produced, and engaged. Thurman Grant is a Los Angeles based architect and educator who specializes in residential and commercial architecture and interiors. Since 2005, he has been an adjunct faculty member at the Woodbury School of Architecture, teaching at its Burbank campus, as well as through the university’s programs in Italy and China. Grant has contributed to a long list of built residential, commercial, institutional and urban design projects, as well as award-winning design competitions in the United States and Asia. Grant is the former president of the LA Forum for Architecture and Urban Design, where he sat on the board of directors from 2009-2013. His first independent exhibition, a collaborative on-site installation with artist Olivia Booth at the MAK Center for Art & Architecture at the Schindler House, was part of Schindler Lab, Round 1 in spring 2011. Joshua G. Stein is the founder Radical Craft and the co-director of the Data Clay Network, a forum for the exploration of digital techniques applied to ceramic materials. Radical Craft is a Los Angeles-based studio that advances an experimental design practice saturated in history, archaeology and craft. This inquiry inflects the production of urban spaces and artifacts by evolving newly grounded approaches to the challenges posed by virtuality, velocity, and globalization. Stein has received numerous grants, awards, and fellowships, including multiple grants from the Graham Foundation for Advanced Studies in the Fine Arts and the AIA Upjohn research award. He was a 2011 Rome Prize Fellow in Architecture and is Professor of Architecture at Woodbury University where he also directs the Institute of Material Ecologies (T-IME). 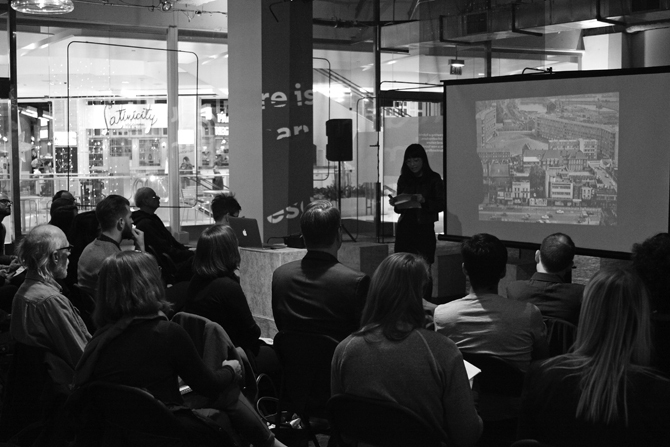 On November 9, 2016, architects Judith De Jong (De Jong Urban Projects), Ang Li (Ang Li Projects), Ryan Palider (Palider Works), Julie Michiels (Perkins+Will), Eric Rothfeder (Eric Rothfeder Architect), Paola Aguirre (borderless), Katherine Darnstadt (Latent Design), and Sean Lally (WEATHERS), participated in the inaugural edition of the MAS Context Couplings series as part of MAS Context’s 2016 Fall Talks series. The event took place at the Chicago Design Museum. 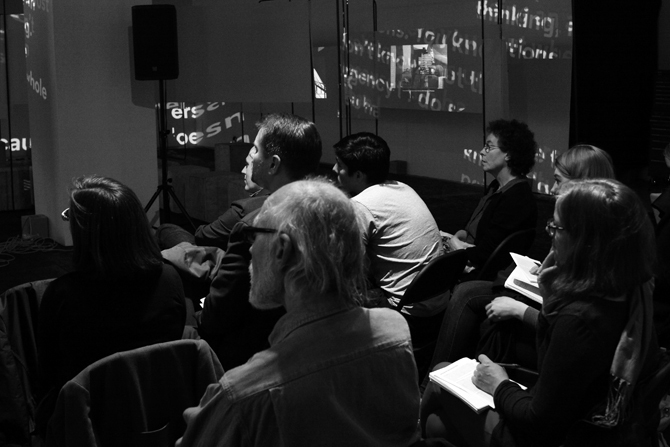 The event explores the influence of past projects, realized or unrealized, in shaping contemporary thinking in a architecture. 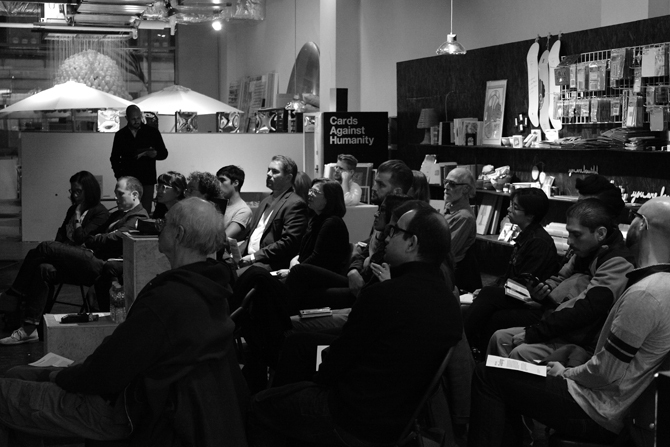 In this edition, each of the eight Chicago-based architects participating in the event will share a project by another architect that they consider relevant for their practice today. 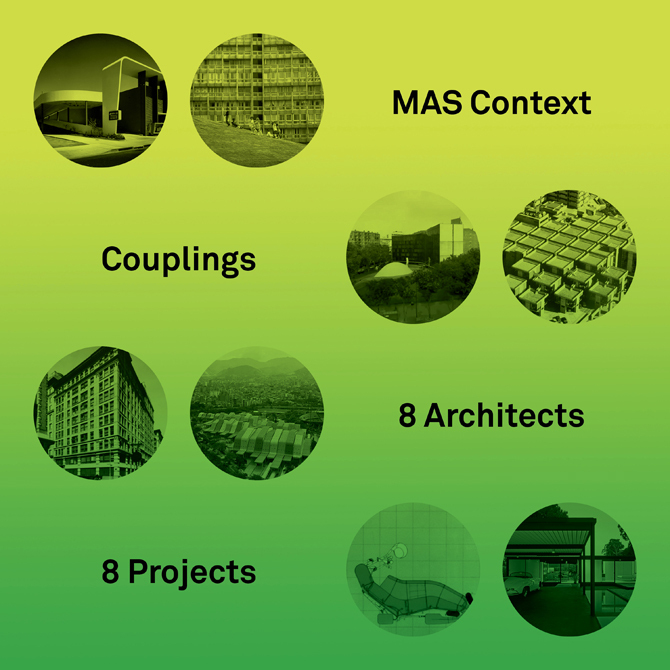 This framework establishes conceptual connections between projects while providing a snapshot of the opportunities and issues at stake in architecture. Below is an edited transcription of their presentations. I am an architect and an urbanist, so my interest lies fundamentally in the reciprocating relationships between architecture and the city and, more specifically, in opportunities for design innovation in architectures and urbanisms of mass culture. Most recently I have been exploring this in writing, as well as through speculative design work for urbanizing suburbs. A project that I have been looking at repeatedly in the past few years is the Milliron’s department store in Los Angeles that was designed by the partnership of the architect Victor Gruen and the designer Elsie Krummeck. There are a few key ideas here that make it conceptually relevant to my practice today. First, it is an early project that hybridizes urban and suburban, and materializes that hybridity through an, at the time, new architecture and urbanism of the automobile. 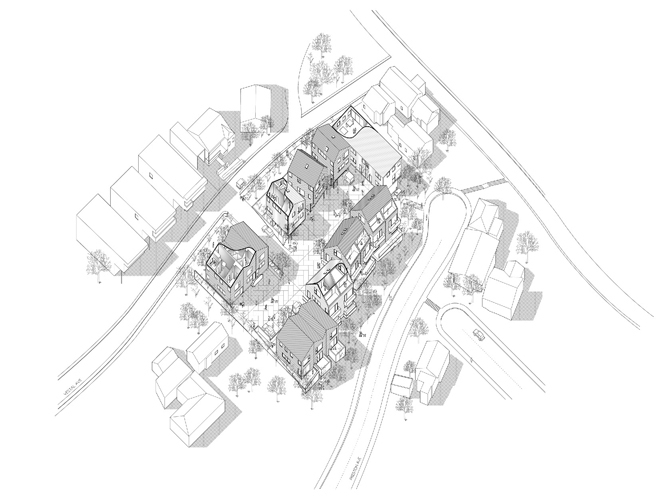 And it explores the possibilities of atypical sites for collective suburban life. And just as a note, with the exception of the next image, which is an aerial image, all of these photos are by the photographer Julius Shulman, who is famous, of course, for photographing the Case Study Houses in Los Angeles. In the post-World War II period we see a fundamental and transformative shift in American life that is materialized in the incredible volume of post-war residential suburbanization. Culturally, America was becoming decidedly suburban, its mobile nature exemplified by, but by no means limited to, the worker who commuted alone by car from a distant home outside the city limits. Built in 1948, Milliron’s was part of a planned urban center in a new suburban community for defense workers. The freestanding store was meant to be only one level and, therefore, consumed quite a lot of its allotted site. The adjacent surface lot didn’t provide sufficient parking, so what they did was locate additional parking on the roof. Now, roof parking is not a new idea, but it is also not particularly typical in the United States. But this inventive approach here made manifest two relatively recent ideas: first, the car was now a distinct, spatializing force in every suburban and urban project; and second, the car could be an agent of innovative built form. At Milliron’s, the concrete frame of the streetside arcade curves down to the ground, creating a portal from the street to two large scissor ramps leading to the roof parking. Pedestrian entry to the store from the rear parking lot occurred under the dynamic crossing of the two ramps, a moment both literally and conceptually framed by the car. Along the main road, the store’s street edge was pulled back, creating a wide sidewalk for pedestrians. The large plate glass windows that you would find in a typical downtown department store were reimagined here as giant display vitrines that were sized to attract attention and broadcast the merchandise, not only to the slower speeds of the pedestrian, but also to the faster speeds of the cars on the adjacent street. 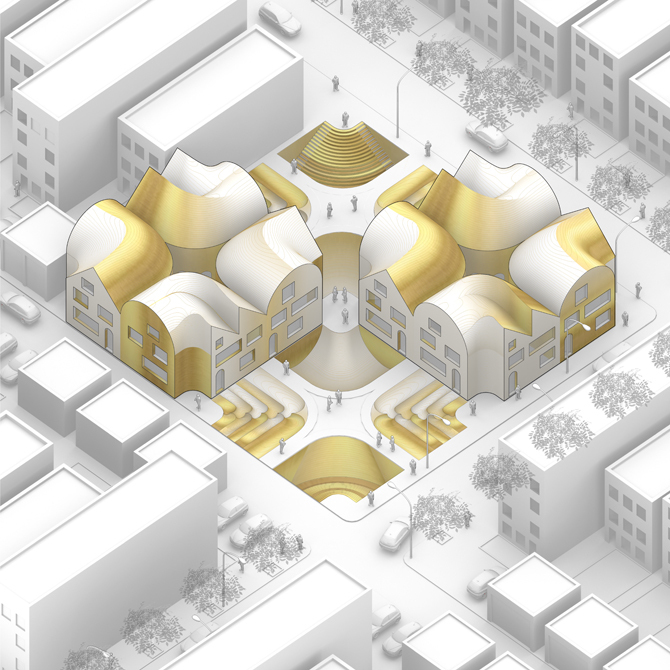 Moreover, the project extends the street from ground to roof, where it explored the possibilities of atypical locations for collective suburban life through additional rooftop programs. On the roof we find a 250-seat community center, a restaurant, and a beauty salon. Importantly, all of these were open past retail hours and were available to the community, so people could come, use the space, host public meetings, and attend public performances even when the store wasn’t open. It was a shared amenity. In the end, Milliron’s is conceptually important for my work because it is an early hybrid urban-suburban project. It explores the spatial impacts and design opportunities of the car, and it proposes that collective suburban life can happen at atypical sites. And I would argue that these ideas continue to be key considerations for architecture and urbanism in the rapidly urbanizing suburban landscape of today’s American metropolis. Thank you. Lately I have been interested in the ways in which architects negotiate architectural afterlives, from rethinking the role of buildings as political agents within preservation and demolition debates to tracing how the dissemination of images of architecture in the media influence the way we think about heritage and the construction of architectural cannons. Today, I want to focus on a particular building that has undergone a series of transformations over the course of its lifetime. The building in question is Alison and Peter Smithson’s Robin Hood Gardens, a Brutalist housing project from the early 1970s that has since experienced a revival in the past few years in the architectural press through a series of ongoing public debates around its imminent demolition. 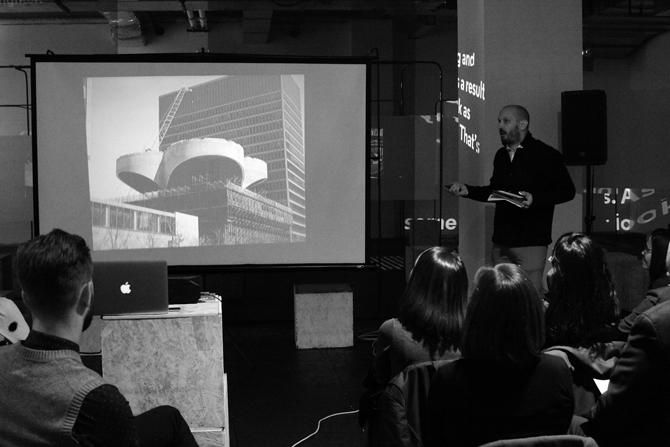 This audience is likely familiar with the project’s architectural provenance, or at the very least has been exposed to many iconic photographs of the building. Today, instead of focusing on a close reading of the architecture itself, I am going to attempt to retrace the recent publication history of Robin Hood Gardens, using the project as a case study to examine the ways in which we evaluate lasting architectural value—what we choose to protect and what we allow to be demolished. Robin Hood Gardens was designed in the late 1960s as council housing for the Greater London Council, the city’s public housing authority, in the London borough of Tower Hamlets. It consists of two precast residential blocks at seven and ten stories each around a landscaped central green mound. The building was designed to house 240 units that includes a combination of 1 bedroom apartments below and 2-6 bedroom maisonettes above. When construction was completed in 1972, the project didn’t initially receive significant coverage. One of the only published mentions of it that year came from a lukewarm review written by Peter Eisenman for Architectural Design that described it as a somewhat compromised version of the Smithsons’ unbuilt schemes. All this changed in 2008, when the building was slated for demolition to make way for the ongoing Blackwall Reach Regeneration Project. In reaction to this news, the British architectural newspaper Building Design launched a widely publicized campaign to list Robin Hood Gardens with English Heritage, gathering letters of support from established figures in the design community such as Richard Rogers, Kenneth Frampton, and Zaha Hadid, to name a few. One of the key arguments for the preservation of the building on the grounds of its architectural significance centered around the Smithsons’ infamous design feature of the “streets in the sky,” a series of open-air balconies that connected the individual units. This unique architectural typology was intended to provide a series of internal streets that would encourage spontaneous interactions amongst the residents and in turn foster a sense of community within the building. In practice, they never lived up to this promise and since the building was first occupied they have faced numerous criticisms over the years for compromising the privacy of the units, harboring crime and isolating the residents from the street life below. Within recent debates around the project’s future fate, these streets in the air have come to symbolize opposing ideologies for both sides of the debate. In a way, they reveal the gap between theory and practice in the Smithsons’ scheme, where the most iconic element of the design is also the very thing that lead to the building’s failure. Looking at a photograph of the streets taken in 1972, the year the building was completed, it is easy to be swept away by the nostalgic charm of the brutalist architecture. But when you turn your attention away from the building itself to focus on the view beyond framed by the balconies, you are presented with an uninterrupted panorama of the urban context of Tower Hamlets in the early 1970s, a series of sprawling, low-rise residential developments. Placed alongside a more recent photograph taken a few years ago from the same angle that captures the recent construction boom taking place around Canary Wharf, the two images reveal the relentless cycles of progress and obsolescence that has come to define this part of London. Under the encroaching pressure of this rapid development, Robin Hood Gardens was eventually denied listing status in 2009 and the developers were given a green light to begin work on site. Since then, the project encountered a number of unplanned hurdles— from the economic crash during the recession, to the discovery of asbestos on site—that drastically slowed down the demolition and redevelopment process. Today, eight years later, both buildings on site remain standing in a state of limbo, even though half the residents have already moved out. When you run a search for images of Robin Hood Gardens today to get a sense of its current status, it is often hard to really understand the temporality of the project. On the one hand, there are the promotional photographs from the developers showing construction teams in hard hats on site, suggesting that work is happily underway. On the other hand, a series of artistic representations of the building by artists, architects and photographers—such as these by the photographer Kois Miah—have emerged during this same period that attempt to memorialize the site by capturing the lives of the remaining residents through personal interviews accompanied by intimate images that capture the interior life of the building—a time capsule of sorts. At the same time, the project’s stalled state also opened up a public stage for a lot of divergent media speculation, with BD taking the lead. Often you would find articles published less than a few months apart that each paint a very different picture of the building’s future through dramatic titles and conflicting imagery, where Robin Hood Gardens is described as being “remodeled,” “replaced,” “revisioned,” and “remembered” all at the same time. Glossy developer renderings of the new residential developments planned for the site are placed alongside black and white construction photos of the project from 1971, further conflating the site’s already complex timeline. Judging from these articles alone, it was often very hard to tell whether the building was on its way up or on its way down. Ironically, the one element of the project that remains unchanged in Robin Hood Gardens’ many representations is the landscaped mound at the center of the site in between the two towers blocks. This is an image that was just released last month by Howarth Tompkins, the latest team of architects who have been selected to design the scheme to replace Robin Hood Gardens—as you can see the proposal maintains this central void. While the “streets in the sky” have become the most divisive element of the building’s design, one might argue that this beloved landscape feature has in many ways taken on the opposite function as an equalizer within recent debates. It is the one thing that everyone can agree on—the developers, the residents, the architectural community have all come to embrace it in their own ways. Here is a photograph taken in 1972 by Peter Smithson capturing Shadrach Woods descending the mound, alongside another image from 2014 depicting a more recent architectural pilgrimage where a group of tourists attempt to climb the mound during a tour organized by the British Council. Further afield, a scaled model of the mound appeared at the 2014 Venice Architecture Biennale in the British Pavilion curated by FAT Architecture and Crimson Architectural Historians. In fact, the model was actually constructed out of earth that had been extracted from the original mound at Robin Hood Gardens and shipped to Venice, so the circle closes in on itself. In many ways, this mound has taken on a monumental status that is at the very least equal to the building itself. Which is why I think it remains important for us to think about where it originated and what it is made of, that even this most unifying feature has a much more contested history embedded within cycles of construction and demolition. This is a photograph taken by Peter Smithson in 1970 from the Smithsons’ archives at the Harvard Graduate School of Design commemorating the day the original terrace houses that occupied the site in the 1960s were demolished to make way for their building, creating a giant mound of debris in its wake. In this image, you can almost see history repeating itself—revealing that this seemingly neutral landscape is in fact both a historic document of what Robin Hood Gardens superseded as well as a premonition of its future obsolescence. For me, the mound provides potent symbol of the inherently cyclical nature of building construction and demolition, and perhaps a good reminder to us all to think more speculatively and expansively about the cultural and material shelf lives of architectural projects. I am interested in the making of architecture and architecture as a disciplinary field that engages in the culture of the world and of the place. I am going to start off by talking about a recent transportation minister in London that sees Brutalist architecture and Late Modernist architecture as ugly and has it in his cross hairs do away with. He would rather put up this neo-classical arch in place of some of the Modernist train stations. The previous presentation already talked about the Robin Hood Gardens which has already been under attack and is soon to be demolished and replaced by these nondescript housing blocks. Even in Chicago, the birthplace of modernism, seminal works are slowly becoming extinct and losing their place in the landscape. I have always had a soft spot in my heart for these monuments of concrete, glass, and steel, and before they are lost to the ethers we all should take a moment to learn the lessons that we can gain from them. Tonight, I would like to talk about Oscar Niemeyer’s French Communist Party headquarters in Paris in terms of form, structure, culture and how these are devices that architects use to produce their work. At first glance, the building is a simple gestural composition: a bent bar, a dome, and a tower. But on closer investigation, these three elements are highly articulated or attuned to each other and the site. The bent bar is made by connecting rational segments of circles and bars. When you look at it in the site, the gestural curvature is responding to the formal context of the site and also transforms it’s context by creating a plaza that engages the city in a meaningful way. I would also argue that the building is also engaging a broader context than just the adjacent buildings of the site. This is the picturesque Parc des Buttes-Chaumont that is a block away filled with neoclassical architectural follies. One could read this building as a modernist folly, as a new park within the city. Context is an important concept within the discipline of architecture, and it is clear that this work by Niemeyer is in conversation with previous works of architecture. Niemeyer is building on the relationship of building to the ground plane set up by Le Corbusier and the attitudes of rooftop garden in the way in which architecture looks back at the city. These Late Modernist buildings are often decried as being highly pragmatic in terms of structure and not given the proper credit in terms of the innovation that one finds in them. To make a massive building delicately hover above the landscape actually takes a lot of structural maneuvering. The building rests upon five pillars. Its underbelly is sculped to produce a tension between the landscape. This tapered floorplate is repeated at each level. The floor slabs are tapered further at the intersection of floor and structure. This produces a sculptural quality to the interior rather than just a mundane repetitive structural frame. The payoff of all this tapering of slab is that because it becomes super thin at the perimeter of the building the façade can become a broad expanse of glass. When inside the rooms of the bar building you get mass and structure on one side and delicate expanses of glass on other side. The glass facade wasn’t designed by Niemeyer, for this he enlisted the help of Jean Prouvé. Proving that architecture isn’t an individual sport but a team sport. The innovation within the curtain wall pushed the limits of technology to produce the upmost, thinnest system possible. And then the client threw in a curve ball. They didn’t want a bourgeois HVAC system, they wanted an operable window to cool the building. Prouvé produced an elegant, operable system that doesn’t detract from the thinness of the façade. All of these details are missed at first glance. Another important move within the building in terms of structure is the decoupling of the core from the bar building. This allows the interior to be opened up and flow throughout the glass bar. The formal quality of the core produces a completely different reading of the building from the backside, where we get a monolithic tower. This move has an experiential payoff too, creating a sequence where occupants go from the darkness of the stair tower to the lightness of the hallway of the glass bar, eventually reaching the glass perimeter and its expansive view of the city. The other thing that I am interested in architecture is engagement in culture, and, particularly through materiality: the real versus the artifice. Modernist architecture gets a bad name when it comes to materiality at times, which I will talk about in a minute. The building came about in the mid-1960s when the French Communist Party received 20% of the vote. They were at the largest size in their history and decided to consolidate their two headquarters into a new building that could communicate the new vision of the French Communist Party. They contacted Oscar Niemeyer, a famed architect and long-time communist that believed that architecture was a political act. Through the composition of the transparent bar and the public promenade in front, the building becomes an architectural response to the mystique of the old Communist Party. Another political move within the project is taking the most hierarchical space within the building, the Assembly Hall of the Party, and putting it out in the most public space, in the center of the plaza. A final bold move that happens within the building is that Niemeyer depoliticizes the ground plane by allowing it to flow underneath the building. The public plaza swoops inside the building and becomes an open lobby to the building organized only by a series of freestanding walls. Creating a free plan that gives the occupants a sense of openness and access to all spaces. The other thing that I mentioned I am interested in my own work is materiality, the real versus the artifice. While these Late Modernist and Brutalist buildings often are decried for an earnest sense of materiality, and this building does have that earnestness, but it is always punctuated through an integration between the real and the artifice. This starts at the plaza where the undulating concrete of the plaza dolm melds into the natural hillside of the landscape. This attitude towards materiality happens again in the building, where the subterranean world of the conference rooms has a diaphanous ceiling that mimics the light of the sky above. So, even though you are below ground, you have this artifice of being open to the sky above. This attitude plays out even in the carpet. The carpet symbolizes the continuation of the landscape from the plaza. The most hierarchical space in the building is the Assembly Hall that takes the form of a dome that dominates the center of the public plaza. As you enter the assembly hall, the hill-like dome becomes a cloud-like interior. A cloud made of pure artifice for artifice’s sake. The interior of the dome is an ornamentation that also serves a function: it solves an acoustic problem due to the shape of the Assembly Hall. This chandelier-like dome never shies away from its artifice as it diffuses the light to producing a cloud-like effect. My one joke is that it was brave for Niemeyer to produce a type of space within the center of the Communist Party that even a Bond villain would feel at home in. Today the Communist party has 5% of the vote in Frances so they have rented out the space in their building. But the architecture still has a cultural relevance, being a backdrop to numerous movies and fashion shoots. It is also the preferred location for a number of animation studios and tech companies. My closing comment is that next time you pass by one of these buildings that worships the cult of the ugly, I ask you to peel back the surface and see the wonderful world that awaits you inside. Thank you. I like a good grid, maybe because I grew up here in Chicago. Not necessarily as a rigid structure, but as something that provides a framework that can be manipulated. It is about human perception and human interaction with it. The majority of the work that I do at Perkins+Will is workplace, and workplaces are the places where we are spending most of our time these days. Going back to the history of workplace, starting at the factory floor, we can see the presence of the grid and we can understand that it applied for efficiency and economy, not with the human worker in mind. Open office became popular in the early twentieth century. Frank Lloyd Wright pushed out walls and got rid of some of that hierarchy that had made its way in, but the spaces were still organized in very neat rows, very much gridded. In the 1950s and 1960s, we see a push back against that, fostering mobility, and making the grid more human. Unfortunately that was able to be cherry picked by the people who were paying for the space, making it back into these efficient, simple, and inhumane rows of workforce. So it looks a lot again like the factory floor but with different machines in front of us. Luckily, we have a sense of humor and it made for some good films such as Jacques Tati’s Playtime. That brings me to Dutch structuralist Herman Hertzberger, one of the few heroes in the design of office space. The reason why I think his work is interesting is in his use of the grid and the ways in which he employed a framework within which people can find their own usefulness and identity. It is not just giving a blank palette to people but giving them some guidelines and some points to work along. I’d like to discuss his Centraal Beheer offices in Apeldoorn, the Netherlands, a building completed in 1972 that recognizes his ideals and exemplifies the structuralist movement. You can instantly see the application of a grid, specifically a 9 by 9 meter Tartan grid. And it is not just about the application of the grid but also about the subtraction and the intersection of the grid as well. Looking at the plan, we can see that he is using it to create a central space at the ground floor. Another thing that is relevant to me in the work that I do is bringing the concepts of urban planning to an interior. Hertzberger was able to use the grid to create interior streets that pulled you through the central plaza for gatherings or many other activities. This organization wasn’t just considered in two dimensions. It was a three-dimensional study as well in order to make it all work together. When the modules are held low there is a potential for access to lower roofs. When the modules are held apart, it allows light to get deep into the spaces as well as views out from parts of a building that might not typically have that available. The building was designed from the inside out, and Hertzberger wasn’t necessarily interested in the form of the building as the starting point. He was more interested in the value of the space that was created inside, understanding the building as a unifying whole in which people could create unique identities. Modularity is part of that interest and exploring how the same module could be used over and over again, the same kit of parts, to create both collective spaces and individual spaces within a single framework. It is important to remember that, in all the current talk about open workplace, collaboration, third place and all that stuff, is not a new idea even when people seem to talk about it like it is. I like that this example demonstrates that. In the images, you can appreciate the urban feel of its interior given by the presence of the streets and the choice of building materials. You see the layering of spaces, different activities happening in proximity of one another. Here is a view overlooking the streets below, and a game of chess happening above. Chess is a good analogy to the design of the building as in the game of chess there are very finite rules but the moves are endless. Finally, one of the important aspects to him was the idea of individualization. Employees were actually encouraged to bring their own furniture. And the architects chose to not photograph the space until, I believe, it was three years into its occupancy, so that people had time to plant their roots there and really made it their own. Typically we all try to hurry up and get in there to take photos before anybody moves in. The building was vacated in 2013 and the developer that owns it now wants to give it a multifunctional use that would include housing. I believe that they have contacted Herman Hertzberger to involve him in the adaptive reuse process. In ending, I think that these values and ideals are relevant today as technology in the workplace drives us to be infinitely adaptable to ways of working that we don’t know yet while, conversely, the environment pushes us to strive for longevity and an infinite use in a building. And, ultimately, the need to consider the users as individuals. Thank you. My talk tonight can be titled Things That Keep Me Up at Night. The Asch Building that you are seeing in the image housed the Triangle Shirtwaist Factory, which in 1911 was the site of the country’s worst industrial accident when 146 workers, mostly young women, died in a fire. It would ultimately galvanize in a workers’ movement that led to substantial changes in labor laws and building laws. Many years later, Frances Perkins, who was FDR’s first Secretary of Labor, said that the New Deal really started on the day of the Triangle Shirtwaist Factory fire. This is a building that typically belongs to the history of the labor movement of the Progressive Era and tends to be excluded from architectural history, but it is relevant for several reasons. First, I think architectural history tends to be a history of successes, but maybe as architects we need to attempt to engage in some of our most intractable problems, and we need to explore our history of failures and their consequences. This project brings up questions of architectural agency and engagement. In particular, I am fascinated by the architect of the Asch Building, John Woolley, whose name has disappeared from history with the exception of a letter that he wrote after the building was completed. In it, he stated to the City of New York that, despite their objections, his building was, in fact, safe. He argued that it didn’t need the three full fire-rated egress stairs the city required and that that two plus an exterior fire escape was sufficient. This was an argument that the city accepted but, during the fire, the very poorly designed fire escape collapsed leading to the death of about a dozen people. I consider Woolley as a sort of metaphor for architectural agency. You look at this situation and it suggests the culpability not just of his choice to engage in a problematic industry, but also extending certain economies and efficiencies for the benefit of the client and at the expense of the workers. In this narrative, Woolley is responsible and we read a kind of architectural agency to cause or prevent the disaster. But there is a little bit more to this story, which is the story of the locked doors. During the trial of the factory’s owners, it became clear that they had locked all of the doors, with the exception of one, as a way to prevent theft and unauthorized breaks. And that was the reason that the death toll was so high. Looking at the story, you can speculate that, even if Woolley had provided an even safer building, if he had provided those three stairs recommended by the city, they would have ultimately been locked. If we as architects provide the doors, but then they are locked beyond our control, then what do we do? It is an irresolvable question, a moral fable and it keeps me up at night. This points to the issue that, as architects, we are oftentimes concerned about the privatization of the public, the incursion of private interest in our public realm. But the Triangle Shirtwaist fire and the building codes that came after it suggest the opposite trend. They suggest the incursion of the public interest on our most privates spaces. The building code is a way for the public to engage private space and private property. In a weird way, the wealthiest maybe have an easier time evading the tax collector, the IRS, than they do the building inspector. It is maybe a lot easier to get away with tax fraud than it is not building a proper ramp. I think that is ultimately powerful. We tend to think of these codes as a nuisance or something that homogenizes space but ultimately there is a great amount of power in that. We should be mindful of that, especially in today’s context. There is a final irony in all this, which is that the building of the Triangle Shirtwaist Factory fire is now occupied by NYU. That university is currently building a satellite campus in Abu Dhabi, a country well known for its labor abuses especially of its construction workers. I don’t present it as a blanket condemnation of the project, but just to suggest that over a hundred years later so many of these issues continue to crop up. Perhaps we need a more nimble way of talking about it than we currently have. Thank you. Tonight I am going to talk about sports. I am not a sports fan whatsoever, but the reason of choosing that topic is to talk about the Four Sports Scenarios project in Medellín, Colombia. The reason for choosing that project is because I wake up every day to the view of the expansion of McCormick Place. For those of you who haven’t been to the South Loop recently, it is a place that is dramatically changing. There is a 40-story hotel and sports and event arena currently under construction that has very flashy vendors and marketing images. I am really interested in seeing this transformation and this area under constant construction. As an architect, I am always thinking about how contemporary practices are encouraging better civic life, the use of public spaces in every single intervention in the city. I am especially interested at this scale and especially when projects like the expansion of McCormick Place are paid, in part, with public dollars. I am constantly thinking about how openness, civicness, and publicness are represented in every single project. I just love the fact that in English, being my second language, you can just put words together that then have a new meaning. I am originally from Mexico and, as an architectural student, I grew up looking at architectural references from very established Latin American architects such as Luis Barragán and Oscar Niemeyer. It was very refreshing to learn, around the year 2010, about a new wave of practices that were emerging in South America that include, Felipe Mesa, who leads a small practice based in Medellin called Plan B. If you know anything about Medellin, you know that fifteen or twenty years ago it wasn’t the friendliest or safest the city, not only in Latin America, but in the world. This specific project is a collaboration between two offices, which is also very interesting. It is a collaboration between Plan B and El Equipo Mazzanti, a 25-year old practice led by Giancarlo Mazzanti. I really am very interested in the idea of architects coming together and collaborating in competitions. Four Sports Scenarios focuses on several things, including reading the landscape and the context to create a new artificial topography. The building is an artificial mound on the street, and it is interesting because Medellin is a city located in a valley. Topography is relevant as a tool to direct views, to work with the sun angles, and to manage ventilation. The building was a renovation of an existing sports complex for the South American Games in 2010. Every time there is a sports event we pour tons of economic resources into sports centers that are probably going to be used only for a few weeks. What they did here was to improve significantly and expand existing facilities. What I really like about it is that this team took this opportunity to amplify public life and public spaces. The project uses perforated steel panels that create a very interesting visual relationship between interior and exterior and change the reading of the building over the duration of the day turning the building into a spectacle. It is the place to be because it is graceful, festive, and in, a way, weird. It is a type of architecture that wants to play a significant role in a country and in a culture that is starting to play with new forms and new types of architecture. What I like is that the design team goes beyond the fulfillment of a very utilitarian footprint. Layouts for sports are very prescribed, so I appreciate the capacity of going beyond what is required and playing with other elements, like the roof strips. They are very interesting not only in the plan but also in section. The continuity is not only achieved through repetition in the horizontal plane, but also by the waving of the structure. At the end of the day, it creates a spectacle not only outside but also in the inside of the building allowing both natural light and ventilation. Whether you know this or not, architectural competitions are quite a new thing in Latin America. They started about fifteen years ago as opportunities emerging from new political frameworks. Public projects are paid with public money so they have very limited budgets, but that doesn’t prevent creative solutions to be applied to the building form and structure. I was very impressed with the steel frames and the solution that they came up with. You have to consider that we are not going to import construction technologies that don’t belong in Latin America, so this building was engineered in order to be built by local workers. This is a consideration that not many contemporary practices keep in mind. I like what happens when sports are not being played, and how the in between space, the interstitial space, works when the building is not open. Any given afternoon, any day after school people just stop by. And it is very interesting how the design team documented the project, positioning themselves as mere observers of all this daily activity. Sometimes they captured a lot of people using it, and sometimes they captured a few young folks enjoying the space. It was an effort to capture the everyday. Ultimately what I really like exploring when studying other architect’s work is to see how a project has the capacity to amplify civic life and public space. It helps me to continue to think about the way designers like me can contribute to create a better public realm and civic life. Thank you. When Iker put this charge to all of us I could think back to lazy afternoons right before studio at IIT and roaming the shelves of Prairie Avenue Bookshop. I remember there was a little green book that broke the line of these really nice spines on the shelf. I looked at it and I was immediately in love. It was a book about Archigram. If you know Latent Design’s work this should not surprise you. But it was something that was really wild to me during school because it was a book that just said, “We dare to dream in color. We dare to dream in something else. And we dare to dream in what’s right now and pragmatic speculation need not apply. We want provocation for provocation’s sake.” One of the first things that struck me was their highly stylized diagram style, and that was what drew me into their work in general. Tonight, I want to talk about their Cushicle and the Suitaloon. Those aren’t real words but they are just fun to say. They are master manipulators of space and of language and that is, in itself, a very liberating thing. The Cushicle was an artificial spine stronger than your own, that you could use to attach elements of your own private life and to create the private space that you desired to venture out into the world. The Suitaloon was this beautiful inflatable structure that was made out of a material yet to be determined. Archigram was very concerned with the influence of space technology and personal modifications to advance urban mobility and the techno future of the mid-1960s to late 1960s. They are embracing the zeitgeist of the time of, “Let’s have maximum personalization and go out and embrace this brave new world that is coming in.” Architecturally and spatially speaking, this was very different. So the Cushicle was the spine and the Suitaloon was an inflatable structure that created your own personal space. And it could be wherever you wanted it to be. You could carry it with you and become your way of living. It looks somewhat like a very high-tech sleeping bag in their renderings, but once you inflated it and saw that it was getting the maximum amount of volume in and the minimum amount of footprint, you get that it could start to be a cladding for a home. This is because they were dealing in the techno future and the techno future had great materials. They were focused on the inflatables, and they would have this wonderful effect on the environment and the space around it. You could hear the rain, you could see the rain, you could watch it move, and flex with the wind. If you inflated it in a space that was just slightly smaller than the Suitaloon could handle, it would start to contour around the space itself and it would start to inform your contact. So you are putting your personal context in the global context and you can physically see them interact and just rub right up against each other. The Suitaloon could start to tether together to other units, and you could start to create spaces as large or as small as you wanted and make communities wherever you needed it to be. That was part of the dialogue that they had as the VIPs of DIY space and looking at how to create spatial elements that weren’t buildings. 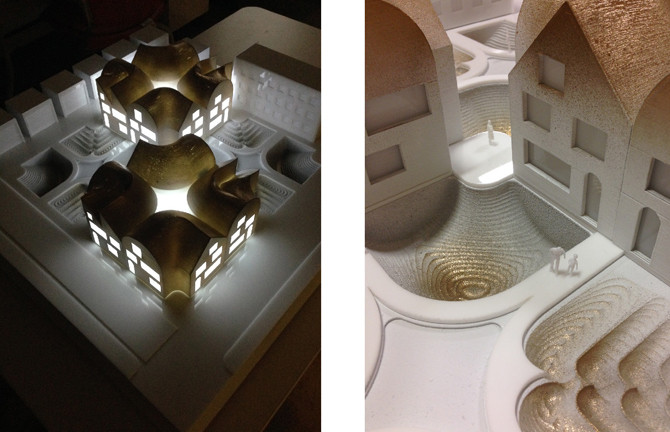 It was interesting to me to see a prototype that wasn’t a building, that was rendered and presented in a very different way and had a narrative that went very counter to the academic experience that I was having at my architecture school at that time. You could still feel that liberation of the 1960s in there, and feel the provocations itself. It took me time to understand it because you didn’t see a building. You wanted it to be a building. 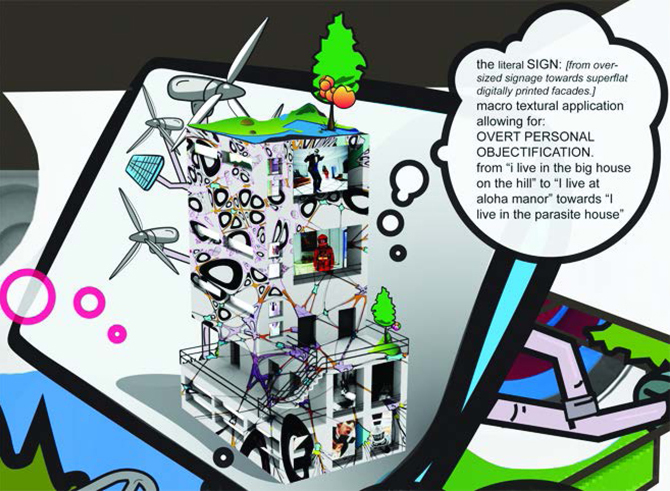 We still have this tension between buildings in the built environment and our personal relationship to them. That design dialogue, that intersection of the Venn diagram, became the motivation for how I want to practice and how my firm strives to have a dialogue with the spaces we want to influence. The Cushicle and the Suitaloon start to look at ways of ultimate self-sufficiency. There’s a thread from those projects, self-sufficiency, and going to space. This image is like a Cushicle and a Suitaloon in one and, as this is much more realistic, it doesn’t seem fantastic. It doesn’t seem fantastic that we have to tether into something to have our life in a space, and that we carry everything with us when we are in space on our way to Mars because we are still new techno humans. It doesn’t seem so fantastic, but it is exactly the same thing. What was interesting about a space like this is we think about it as tethering together and creating a community, but we are actually inadvertently creating isolation because we are creating our exact own space by literally living in a bubble. We are continuing to do that now in ways where we have the self-curating isolation as we innovate ourselves into other types of Suitaloon with VR technology and other realms. These threads are continuing throughout our design narrative and it is talking about that relationship between ourselves and the built environment. And, as architects, that is a dialogue we need to continue to have. It is not only buildings as the ultimate final solution. Sometimes it is that provocation and the expansion of the design idea to go further when we talk about the built environment and how we interact with it beyond just the buildings. From the 1960s on we have talked about how our house will last less time than we do. We know that already. We know our buildings are not going to last 100 years anymore and we are okay with that. We understand that they are going to get demolished, and we want them to be expendable because we want something new. So, how does it look when every generation has to make its own city? What does that city look like? I will always go back to Archigram and think about what they thought about, the conversations that they had, and what they prototyped. Thank you. Believe it or not I think there is actually a bit of a correlation between Katherine’s presentation and mine. It is not going to seem particularly obvious at first, but I’ll try to draw that overlap out. I have an office called WEATHERS based here in Chicago and, to give a little bit of background about it, the approach of the design work and the research in general is tied to this idea of looking at materiality and the human body, but maybe not the same way we normally think about materials. We typically think about glass, steel, and concrete as a way of building space. The interest of WEATHERS is really about how we can think of energy as another material that doesn’t have to fill the interior of the space but can actually define its own microclimates of outdoor landscapes. I just picked the project that I liked and then post-rationalized why I should talk about it. I chose Pierre Koenig’s Case Study House #21, which is also known as the Bailey House. It was built in 1958. The Case Study Houses have often been talked about as almost a movement in themselves, while others might say, not quite. Arts & Architecture magazine, ran by John Entenza, launched the Case Study House Program to try to think what the technologies and materials developed for WWII could mean to architecture. There were thirty-six designs as part of the program, but not all of them were built. Multiple architects designed them, such as Richard Neutra, Craig Ellwood, Raphael Soriano, Charles and Ray Eames, and Pierre Koenig, and some did more than one house. This house has always been very fascinating to me because it barely exists. When you are driving by, or if you look on Google Maps, it almost doesn’t feel like it belongs there. I unfortunately have not been to this project, although I have been to the Case Study House #22, which is another one that, I can tell you, when you show up to it is hard to believe from the outside gate, that it qualifies as a house. Case Study House #22 is really nothing but corrugated metal that you walk beyond to reveal the glass, structure and view beyond that you associate as the house. These homes had steel structures, a degree of glass, and a corrugated metal curtain, used as the perimeter move. There is a strong relationship between the house and the landscape itself, which of course works quite well when you are in Southern California with its enviable climate. It takes advantage of that and works with a series of other moves. A lot of the walls don’t actually even make their way up to the roof so it allows for cross ventilation. What really interests me, and this is where I will make a link back to Katherine’s presentation, is that so much of what you see as the building structure almost becomes furniture. A type of landscape furniture now associated with being a house. This is a Julius Schulman photograph where you see the actual furniture that was bought. Ironically enough, I would say this is one of those photos that actually shut down the project to the point where it looks like it is massive. 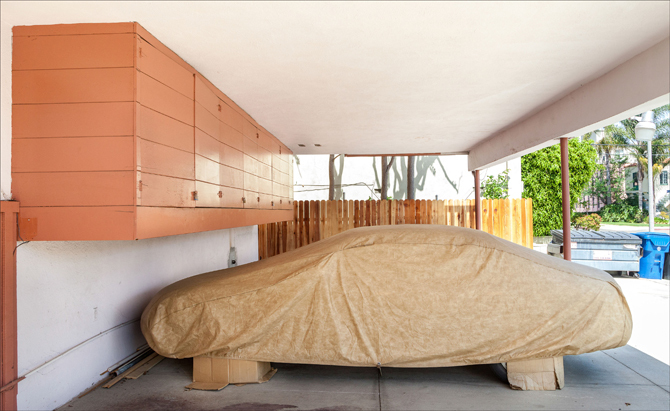 It looks like it is this solid project where the only thing you can see is a little bit of the car in the driveway, when in reality it has a completely different feel to it. Even the furniture itself doesn’t become a room. Other than the exhaust that makes its way up through here to the roof, the kitchen itself is nothing more than a piece of furniture in a larger space. This is why I think I have always really enjoyed this project. Because the house is barely there, a lot of the responsibilities of living move to the furniture systems. Everything moves to the furniture scale and the architectural structure itself almost wishes itself to go away. If you look at a lineage of architectural form, you can see in Chicago the Monadnock Building, where it starts with the big 8-foot thick walls at the bottom that get thinner as they come up as masonry. Its newer version, on the south side of the block, is made out of steel, becoming much thinner. Masonry, glass, and steel have always been a way of thinning of the perimeter wall. If you didn’t know better, you would think architects just wanted it to go away. And I feel like this is a great example of essentially the closest you can come to making it disappear altogether without actually removing a surface that divides inside from outside. I like to ask, can we get rid of it? Can we actually augment climate materials and entities and our human bodies to engage with them as a form of architecture? The example I always give is street lighting, which is, as far as I’m concerned, an architectural form. It has a shape, it has an interior, it has an aesthetic, it provides safety, and organizes program and activities. So it meets all the criteria of an architectural project. Except it is purely energy. It has shape for the human eye. So when you look back at the Case Study House #21, other than the bathrooms, which are completely sealed, you start seeing that everything is essentially a kind of small furniture scale project. It is this moment where I would say we have come the closest to basically removing geometric form in order to create an architectural space. The thing that is important about this, too, is that it still meets all the required criteria and responsibilities of architecture. You can still cook your food. You can still go to sleep at night not having rain on you. It still does all the things we think of architecture needing to do. But what’s the next step? Can architects move yet another step forward to produce a house with even less geometric form. A house consisting more of local climatic energies like an intense street light? How do you get a mortgage on something like this? How do you get a bank to say, “Yes, let’s go for it. Let’s give you a loan to build this.” The great irony of all this is that this house now is currently for sale for three million dollars. If you have three million dollars, see me after the event. Thank you. Thanks to the Chicago Design Museum for hosting the event. Paola Aguirre is an architectural and urban designer, founder of Borderless Studio, a collaborative and interdisciplinary design consultancy based in Chicago, and the Borderless Workshop, a collaborative research platform focused on the future of cities in the US-MX border region. 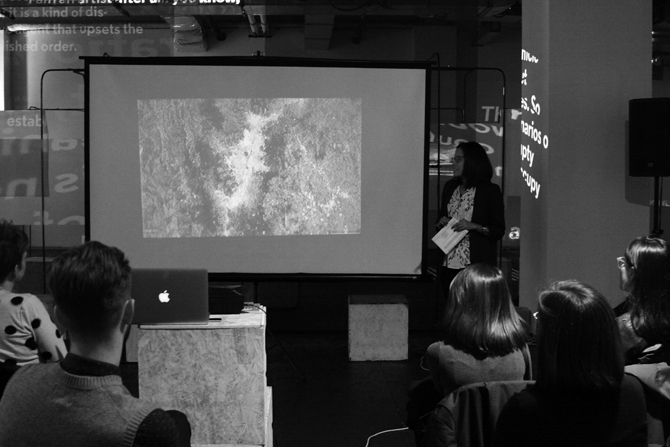 Paola’s transnational background and strong collaborative approach focus her research and design practice on multidisciplinary exchange and urban systems integration. 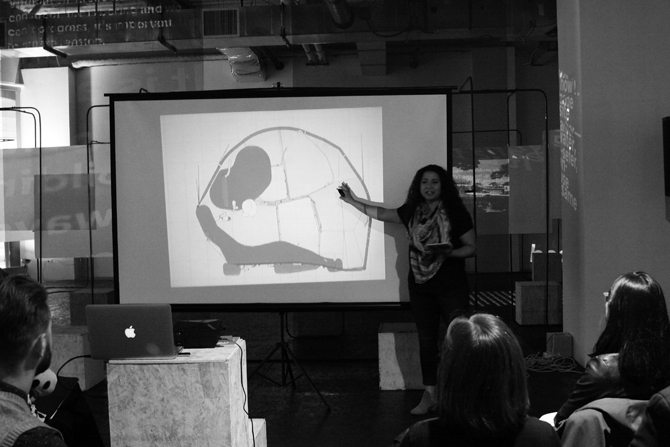 Paola is an active educator, currently teaching at the School of the Art Institute of Chicago and Archeworks. Katherine Darnstadt is an architect, educator, and the founder and principal of Latent Design, a collaborative of individuals whose projects focus on social, economic, and environmental impact beyond the building. Katherine brings innovative design to those in resource and budget limited environments through a holistic, creative approach to design driven by community needs that leverages other partners and assets to address project challenges. Her passion for public interest design through participatory strategies and diverse background have allowed her to collaborate with change agents in design, science, arts, and philosophy. Katherine and her firm have been recognized as an emerging leader in the architecture profession and have been published, exhibited, and featured widely, most notably at the International Venice Biennale, Core 77 Design Awards, Architizer A+ Awards, Chicago Ideas Week, NPR, and as the 2013 American Institute of Architects Young Architects Honor Award winner. of Architecture at the University of Illinois at Chicago, whose work investigates the reciprocating relationships between architecture and the city, and the opportunities for design innovation in architectures and urbanisms of mass culture. Her book, New SubUrbanisms, was published in 2013. De Jong has received support from the Graham Foundation for Advanced Study in the Fine Arts and the Great Cities Institute, where she was a 2011-2012 Faculty Scholar, and has presented her work in the U.S. and abroad. She has written for MONU, Land Forum, CITE: The Architecture and Design Review of Houston, and The Journal of Architectural Education, among others, and her proposal “How the Strip Mall Can Save Suburbia” was a finalist in the 2010 Build A Better Burb competition. Sean Lally is the founder of the design office Weathers. Sean Lally’s work is a synthesis of two intense pressures on society today: humanity’s manipulation of the environment and the bio engineering of the human body. 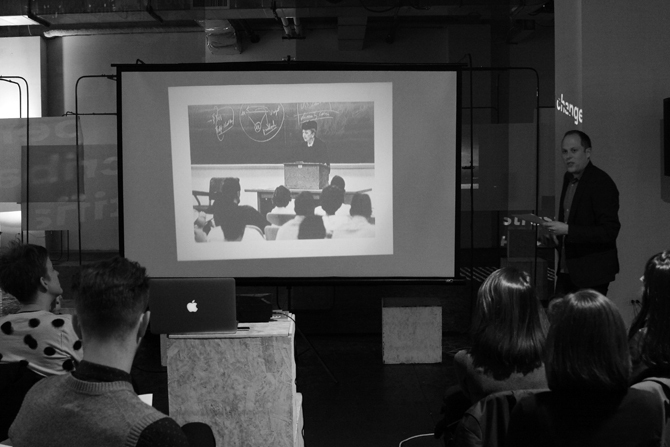 Lally is the author of the book The Air from Other Planets: A Brief History of Architecture to Come (2014). He is the recipient of the Prince Charitable Trusts Rome Prize from the American Academy in Rome in Landscape Architecture and the winner of the Architectural League Prize for Young Architects and Designers Award. Sean is the author of Night White Skies, a weekly podcast about architecture’s future, and a tenured associate professor at the University of Illinois at Chicago in the School of Architecture. Ang Li is an architect and Visiting Artist in the department of Architecture, Interior Architecture, and Designed Objects at the School of the Art Institute of Chicago. Her recent work explores questions of appropriation and historical sampling in contemporary design culture through drawings, publications, and built installations. She is particularly interested in cross-disciplinary approaches to architectural production that focus on the material history and cultural agency of existing building practices. 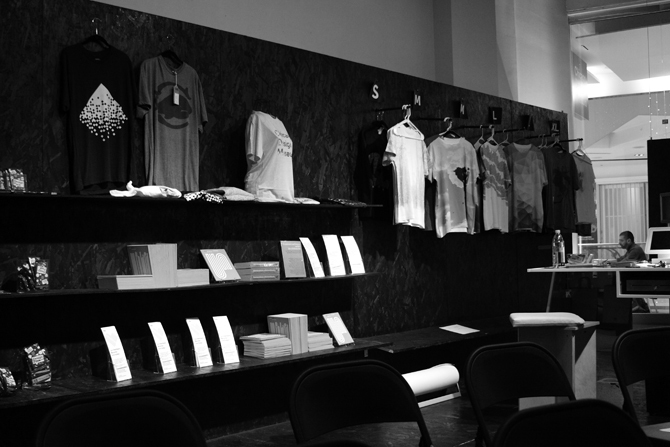 Ang has participated in exhibitions at the Echo Art Fair in Buffalo, New York, the Lisbon Architecture Triennale, and Storefront for Art and Architecture. Her writing and work has been published in Pidgin, Clog, Thresholds, Manifest, Abitare, Wired, and Blueprint. Before coming to the SAIC she was a Visiting Assistant Professor and the 2015-16 Peter Reyner Banham Fellow at the University at Buffalo. She holds a BA in architecture from the University of Cambridge, and a M.Arch. from Princeton University, where she also served as an editor of Pidgin Magazine. Previously, she worked for number of architectural offices, including Adjaye Associates (New York), Marge Arkitekter (Stockholm) and Allies and Morrison Architects (London). Julie Michiels is an architect and senior project designer with Perkins+Will in Chicago. With a focus on shaping how people experience interior spaces, she works on projects that range widely in location, scale, and program, from local pro-bono work to international transit hubs, and plenty more in-between. She is also a contributing editor of the design journal MAS Context and frequent collaborator with the design office MAS Studio. 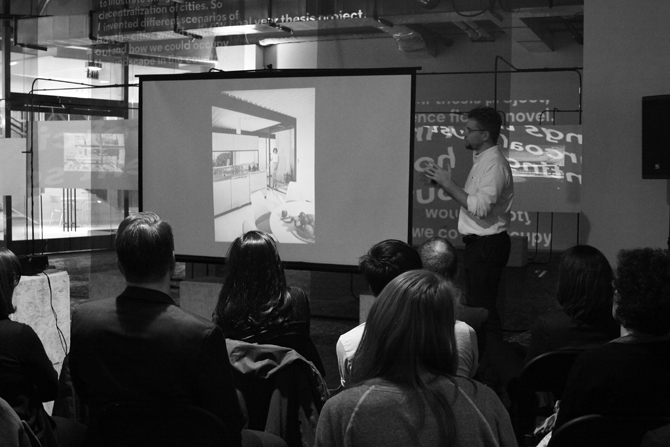 Ryan Palider is an architect and educator interested in architecture as a social, political, and cultural discipline. His design work explores a variety of scales, from installations to institutional buildings, and explores material qualities and fabrication methods as a means of translating disciplinary ideas into built environments. He previously taught and coordinated the Fabrication Lab at the Knowlton School of Architecture, The Ohio State University (OSU). He seeks to rethink the traditional notion of design-build by conceiving of construction as a continuation of the design process. 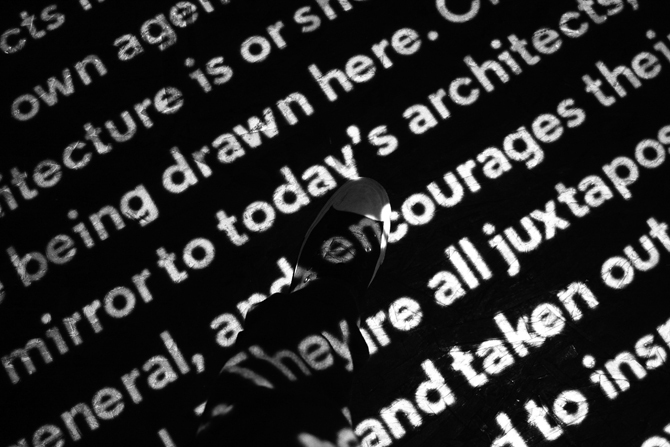 In addition to academic work, he runs Palider Works, a collaborative design practice. Projects include the design of a single-family residence in Tomahawk, Wisconsin and the design and renovation of numerous private homes in Columbus, Ohio and Chicago, Illinois. In 2015 he led a team that was a finalist in the 2015 Chicago Architecture Biennial Kiosk competition. Eric Rothfeder is an architect and faculty member at the School of the Art Institute of Chicago. His research and design projects have been exhibited at the BSA Space in Boston, the Storefront for Art and Architecture, and the Fondazione Sandretto in Italy; and published in Domus, Bidoun, La Vanguardia (Barcelona), Competitions Magazine, and the Architect’s Newspaper. He has worked as a designer and project architect at the offices of Diller Scofidio + Renfro, KieranTimberlake and LevenBetts. He received a B.A. with Distinction from Yale University and an M.Arch from Princeton University. He has taught at the New York Institute of Technology and at Princeton University, and in 2013 he was an Artist in Residence at the Cape Cod Modern House Trust.